This paper was inspired by the industrial and railway aspects of a ten-week course on the “Evolution of Landscape in Snowdonia” organised by University of Wales Bangor at the Community Centre, Craig y Don, Llandudno and given early in 2002 by Gwilym T. Jones of the University of Wales, Bangor. The paper draws heavily on the writer’s longstanding interest in the narrow gauge railways of North Wales and in particular the Ffestiniog and Welsh Highland Railways. Edited by the author for reproduction on this website, various dates. Photographs added December 2007, Noel Walley. Based on the above definition, Snowdonia can be seen to include the Penmaenmawr granite quarries, the Bethesda and Dinorwig slate quarries, Blaenau Ffestiniog and its extensive slate mines, the Crimea Pass, the Lledr Valley and Cwm Machno and also the Nantlle and Bryngwyn groups of slate quarries, plus the Snowdonia tourist areas. The significant and extensive areas of the Snowdonia National Park to the southeast including the Rhinogs, the Arenigs, the Arans and Cader Idris are excluded from the area. The fourteen Welsh Mountains over 3,000 feet high are all contained within the above area, and to climb them all in one day is considered a challenge by serious hill walkers. Thomas Firbank and two friends established a new record in 1938 of eight hours twenty minutes (down from 10½ hours) by following a novel and carefully planned route starting at the summit of Snowdon (having previously ascended by train – this was normal practice) and ending at the summit of Foel Fras. The route was in excess of 24 miles and involved a total assent and descent of 18,000 feet. The current record is apparently less than five hours! Firbank’s wife Esmé, in a separate party with Thomas, their shepherd, starting earlier on the same day and by the same route, established a new woman’s record of nine hours 25 minutes, which was over one hour faster than the previous best by a man. Her contribution to the route planning had also been significant. Esmé and her second husband Peter Kirby later founded the Snowdonia National Park Society, exercising considerable influence in the conservation lobby. She died in 1999. The impact of railways on the Snowdonian landscape, apart from the Snowdon Mountain Railway and those lines associated with quarrying, has been largely peripheral. The main railway lines date from the second half of the nineteenth century and mainly follow the boundaries used for this study. Firstly, the L&NWR line from Llandudno Junction to Menai Bridge and Caernarfon, which then continued south to Afon Wen, where the Cambrian Railways took the line eastwards to Porthmadog and Minffordd. The Ffestiniog Railway then ran northwards to Blaenau Ffestiniog with the L&NWR completing the circuit back to Llandudno Junction. For over fifty years, this circuit formed a marathon day excursion involving at least four changes of train. With the exception of Menai Bridge to Caernarfon and Afon Wen, all these railways still exist. Short branches to Bethesda and Llanberis were also closed during the 1950’s or 60’s. Mining and quarrying down the centuries in Snowdonia had been concerned with the search for and extraction of non-ferrus metallic ores wherever they could be found. These workings had generally been abandoned by the 19th century, but the evidence of such is there for all to see, leaving a permanent impact on the slopes of Snowdon itself. At first slow to establish, by 1801, slate was being worked in each of the four main slate areas of Snowdonia. The impact of slate working on the landscape of Snowdonia came late but by the start of the nineteenth century the presence of the slate quarries was noticeable and the environmental impact of this quickly growing industry soon became enormous. Granite quarrying came to Snowdonia even later. More extensive than any other industrial activity in Snowdonia, the impact of quarrying is clear for all to see. Once it became established as a major industry, slate was to dominate in one form or another the Snowdonian labour market for over 150 years. This resulted in the establishment of new towns and villages, which in themselves were a factor in the evolution of the landscape. A good transport system was vital to the success of the quarries and most quarries were linked by narrow gauge railways and tramways to nearby ports and/or to standard gauge wharves for distribution throughout the country. This paper concentrates on the transport aspects of the slate industry, which significantly reduced handling costs and enabled quarrying to develop at a far faster rate than otherwise would have happened. The establishment of the quarries led to the establishment of service industries especially iron foundries such as the Britannia foundry by the Cob at Porthmadog (now demolished and replaced by the local Tax Office) and the firm of De Winton at Caernarfon (this historic listed foundry in St. Helen’s Road survives as a plumber’s showroom). Both these companies served the ship building industry as well as quarrying, mining and railways. De Winton & Co. also built a small steam engine for quarry use with a distinctive vertical boiler adapted from that firm’s marine experience. These engines were hand built to order and it is believed no two were identical although all were similar. Iron beams cast by De Winton & Co. survive in the roof of the former railway tunnel, now a little used road tunnel, under the centre of Caernarfon. In the early 19th century, most quarrymen were also farm labourers or smallholders and quarrying for some was only a part time occupation. But many men travelled considerable distances on foot to work, leaving home very early on Monday and stayed all week at the quarries living in barracks and then walking home on Saturday afternoon. Later, trains and even later, buses enabled them to stay at home and travel daily to work. Those who travelled by train would pass the time engaged in conversation or story telling or on the Ffestiniog Railway at least (where the later quarrymen’s carriages held 14 men) formed themselves into small choirs. However, many men tired of hours of travelling or lonely barracks and built for themselves cottages or had built for them terraced cottages near the quarries – in this way new villages and towns like Bethesda and Blaenau Ffestiniog became established in the countryside. Many of the old quarry barracks have been demolished or put to other use but others remain derelict. The 20th century saw the building of local authority housing to meet the increasing needs. Important in any industry are the relationships existing between master and servant, within the place of work, and between different groups of men. This is as true in the slate industry as anywhere. At Bethesda, there was just one master, Lord Penrhyn, the only employer of quarry labour, and Bethesda had quite the worst labour relations of the whole industry. Llanberis had Dinorwic quarry, the principal employer, but also ten smaller employers across the valley. All are now closed. But it was at Ffestiniog with its multiplicity of employers big and small that, it has been said, the best labour relations and loyalties were to be found. Today, Ffestiniog produces very little slate. The Bethesda strike, early in the 20th century, through stubbornness and high principles on both sides, lasted three years – when it ought to have been settled in three months or less. This strike did lasting damage to the slate industry as customers looked elsewhere for roofing materials. Some men continued to work during the strike. But also, two large male-voice choirs toured Britain raising contributions for the strike hardship funds. Great bitterness and long lasting animosity developed between strikers and strikebreakers and between the workforce and the proprietors, poisoning community relations. These damaging results continue to this day. Ironically Bethesda is the only quarry still producing slate in quantity. Two simple lists of qualities and uses are sufficient to show why, given cheap transport, and an improved quality of life – in the kingdom as well as in the locality, the slate industry blossomed and flourished within two decades. Ultimately the high waste factor and the high levels of manual skill and effort needed to produce roofing slates, with no possibility of the mechanisation of the core skills, led to the quick demise of slate once mass production methods were introduced to the making of ceramic tiles. Slate can be carved and even turned on a lathe. Slate possesses attractive natural colour-fast colours. Most of the extensive deposits of roofing slate in England and Wales are to be found in Snowdonia and principally in the four major quarrying areas of Bethesda, Llanberis, Nantlle and Ffestiniog. Of these, the first three are comprised of the oldest slate in the world, the Cambrian. It is hard and brittle and is principally used for roofing. The fourth is the relatively softer and slightly younger Ordovician slate mined in the Ffestiniog district. The ‘Golden Age’ for Welsh Slate Production was the 19th century when quarry owners made great fortunes. The 20th century saw slate decline as rapidly as it had developed. The Penrhyn ‘blue’ copper-rich mudstone slate is the characteristic output of the Bethesda Quarry. The township of Bethesda on the A5 five miles south of Bangor was founded by quarrymen who worked in Lord Penrhyn’s quarry on the slopes of Elider Fawr to the west of that road. The first railway to be built in Caernarfonshire was the 1ft 10¾ ins. gauge horse tramway with inclined planes between relatively level sections designed and built in 1801 by Benjamin Wyatt, agent to the first Lord Penrhyn, for the carriage of slate from Bethesda to Port Penrhyn (6¼ miles). On the death of the first Lord Penrhyn, the quarry, tramway and port passed to Col. Douglas Pennant (a Penrhyn by marriage) who in 1866 was created Baron Penrhyn of Llandegai. At that time the quarry employed over 3,000 men and over 60,000 tons of dressed slate per annum were carried by horse tram to Port Penrhyn. In 1877, Lord Penrhyn had the railway rebuilt to plans prepared by Charles Easton Spooner (of the Ffestiniog Railway) on an altered course and without inclined planes to facilitate the use of locomotives. Three small engines were bought from De Winton of Caernarfon in 1878 and later Hunslet’s of Leeds supplied Charles, Linda and Blanche. Many other small engines worked in the quarry. A later connection at Port Penrhyn with the LMS main line enabled slate to be forwarded to British destinations by rail. The Penrhyn line did not operate a public passenger service. It did, however, possess a single coach, known as the ‘Penrhyn Coach’, for the use of Lord Penrhyn and his guests. It had been built by the quarry’s own staff. It is said that a fitter and a carpenter were sent to Bangor station and given a day to examine an L.N.W.R coach parked in a siding. They noted what was required – a scaled down version for the narrow-gauge line! The railway did however operate a workmen’s train comprising a rake of hand braked four wheeled completely open carriages. These carriages were not owned by the quarry but by a co-operative of the quarrymen and ran from the Quay to the Quarry with stations at Tregarth and Felin Hen. The last workmen’s train ran on 9th February 1951. For many years, prior to his retirement in the 1950’s, the quarry had a remarkable chief engineer J. H. Battersby who controlled the maintenance and operation of the 27 engines as well as all other machinery and equipment of the quarry and who was held in such high regard that, it is said, no independent boiler insurance tests were held, his certification being sufficient. The line to Port Penrhyn finally closed on 26th July 1962. Charles is preserved in his original condition at Penrhyn Castle. Linda & Blanche and most of the rails were bought by the Ffestiniog Railway and are still in use. These engines are remarkably powerful for their size and each has been totally rebuilt in the forty years since purchase by the FR during which time they have run in excess of 200,000 miles each. The town of Bethesda, which takes its name from the principal nonconformist chapel, started as a small village built by and for the quarrymen working in Lord Penrhyn’s Quarry across the valley. It now occupies an area somewhat larger than that of the quarry itself. On the O.S. map, the quarry and its waste tips occupy a single site about 1½ miles long by about 1 mile wide for over half its length. Early in the 1960’s a major engineering company with no previous experience in slate invested more than a million pounds in total modernisation and made a successful transformation of an ailing business. Today, Alfred McAlpine Ltd is the major producer in North Wales and offers Welsh slate for sale in three finishes ‘flamed’, ‘riven’ and ‘fine-rubbed’ each of the following colours ‘Heather Blue’, ‘Heather Red’ and ‘Heather Grey’ all from the Penrhyn Quarry plus ‘Blue-Grey’ from Ffestiniog and ‘Dark Blue-Grey’ from Cwt y Bugail (Ffestiniog). Alfred McAlpine Ltd also own The Hilltop Quarries in the USA and sell American-Cambrian slates in green, purple and red. The other major supplier of slate in Britain is the Westmorland Slate Company, which offers Spanish roofing slate with an expected life 40 to 50 years and American (not Hilltop) with a claimed life expectancy of over 100 years as well as traditional British slates, which will certainly last well in excess of 100 years. On the southwestern side of Elidir Fawr in the vale of Llanberis is the enormous Dinorwic Quarry formerly owned by the Assheton Smiths. When the quarry (effectively two quarries side-by-side) finally closed in 1969, there were 22 named galleries (ponciau) or level shelves on each side, although the layout is not nearly so symmetrical as the official charts and diagrams suggest (On a photograph there appear to be at least 27 levels). The width of the galleries varies from about twelve feet to a hundred feet or more. The two sides Garret Side and Braich Side each had their own inclines and lifts by which to lower the newly quarried slate to the dressing sheds below. There were nine permanent inclines on Braich side and ten on Garret side. Bottom level was at about 350 ft above sea level with the two highest levels at over 2,100 feet. Thus the quarry visibly stands one third of a mile high, over half a mile deep, and almost a mile in length, dominating the valley and with extensive waste tips on both sides. It is a natural skyscraper factory – yet every square-inch a man-made construction – the tallest factory in the world! Across the valley, the Snowdon Mountain Railway, in its publicity flier for 2001, claims that its Halfway Station “stands at 1,641 ft (500 metres) the height of the world’s tallest building – The Petronas Tower in Kuala Lumpur”. The Dinorwic Quarries stand over 500 feet taller. Of course, it would be a better boast for the Malayan Skyscraper to say it is half the height of Snowdon, than that after half-an-hour’s huffing and puffing and a two mile journey, the little train has reached the roof of an Oriental building! The Snowdon Mountain Tramway and Hotel Company (entirely commercial) is of course responsible for the highest rubbish dump in Wales (as it was recently called). The Swiss (inventors, or so it seems, of public inquiries and referenda) built very many mountain railways (an American invention based on a British idea but fully developed in Switzerland with significant Italian help) in the teeth of enormous public opposition and consequently manage the summits rather better than we do. Walkers, I suspect, are responsible for a greater ongoing impact on Snowdon than the mountain railway and its passengers. But walkers (by the Llanberis path) and passengers alike get spectacular views of the Dinorwic Quarries. In its hey-day the Quarry owned 25 steam engines operating on the 1ft 10¾ ins. quarry tramways. These engines often spent many years working always on the same level, since, owing to their weight, it was necessary to dismantle engines before they could be moved up and down the inclines. In order to maintain these locomotives, well-equipped engine sheds were provided on most levels. One engine, Bernstein, built new in 1898 spent 24 years shunting at Port Dinorwic then ten years at New York (600 ft) then, after overhaul, had a continuous spell of 33 years at Pen Garret 1,500 feet above sea level, during which time it had several major overhauls and the fitting of a new boiler. Red Damsel also had a new boiler fitted during an overhaul in Lernion shed at 1,860 feet above sea level. This was the highest engine shed in Britain. The total length of internal quarry lines was about 25 miles. One of the lines was the village tramway that linked the main quarry with Dinorwic village and also the satellite quarry of Allt Ddu. This line ran along a road that was also part of the bus route and there are records of the quarry engine coming to the rescue of the village bus stuck in a snowdrift! Maid Marion was specially built in 1903 with a steam dome in order to meet the particular needs of this steep branch. She remained in use on the village branch for 27 years until replaced in 1930 by Lady Madcap. Engines when built new for the quarry tended to be named after favourite racehorses in the Assheton Smith stables. Slate slab wagons called ‘car cyrn’, were specially designed for lowering down inclines (or hauling up laden with slabs), and conveyed the rough slate slabs to the cutting sheds – these sheds were built at convenient locations on the galleries. Owing to the very large amount of waste, it made no sense to take undressed slate down to Gilfach Ddu and then have to bring the waste back up for dumping. The quarry offices, the hospital and the extensive workshops for the maintenance of wagons, engines and equipment were located on ‘ground level’ in an impressive building at Gilfach Ddu where the slate industry museum is now housed. This fine building is said to be in the style of an Anglo-Indian fort. Dressed roofing slates were taken from Gilfach Ddu to Port Dinorwic (Felinheli) by narrow gauge railway. The first line, involving the use of inclines, was built in 1824 and was of 1ft 10¾ ins. gauge. It was worked by horses. In 1843, in order to avoid the use of inclines, a new route was established, still horse worked, This new line was built using the quarries own labour but with James Spooner of Portmadoc as Consultant. By 1849, traffic was exceeding the capacity of a horse tramway and steam locomotives, still in their infancy, were introduced. These were built to a track gauge of exactly 4ft (i.e. 8½ inches narrower than the standard gauge). The first two engines, built by A. Horlock of South London, a lesser known builder, and named Fire Queen and Jenny Lind, they operated the trains to Port Dinorwic until 1886 when the first of three Hunslet 0-6-0 tank engines arrived. These were named Dinorwic, Amalthaea and Velinheli. On withdrawal from service, Fire Queen, was deliberately walled up by the senior management (hidden – but with occasional cleaning and greasing), unusual preservation in the 19th century. It is now preserved at Penrhyn Castle. On the 4 ft gauge main line, the 1ft 10¾ ins. gauge slate wagons were carried on 4 wheel flat wagons fitted with rails – an early example of the use of transporter-wagons – which continued until closure of the railway in 1961. The Quarry Company had its head office at the port and also owned the ships sailing out of Port Dinorwic. One of their ships was said to have been the first vessel to sail into Manchester at the opening of the Ship Canal in 1894. A connection at Port Dinorwic with the LMS main line enabled slate to be forwarded to British destinations by rail. Slate trains continued to run to Felinheli (the original name of the port = ‘salt water mill’ = an ancient device for harnessing tidal rise and fall) until 1961, when diesel lorries took over the transport of finished slate. Major rock falls in the 1950’s & 60’s had seriously hindered quarry operations and a quarry at Marchlyn two miles north of Dinorwic was reopened using modern methods and diesel trucks. The trains were scrapped and modern methods were extended to the Dinorwic quarry. But it was all too late. Capital expenditure had been very heavy and production was not recouping the costs. On July 10th 1969, the Dinorwic Slate Quarries Co. Ltd., owners of the largest slate quarry in the world went into liquidation. Unlike Bethesda, where there is almost complete separation of quarry and town on opposite sides of the valley, and yet paradoxically it would seem that the Bethesda quarrymen travelled shorter distances to work than elsewhere, Dinorwic has, in addition to the main quarries many smaller long disused quarries scattered over a wide area. Nor does Dinorwic have one significant town to match the size of Bethesda. Deiniolen, Llanberis, Cwmyglo, Llanrug, Bethel and many other places provided quarrymen. Some men walked from Waunfawr and others travelled weekly from Anglesey to lodge in the barracks. The Dinorwic Slate Quarries Railway was late with the provision of a workmen’s train, but the workers had their own sturdy private enterprise, manually propelled, four wheeled, totally open, rail-cars called ‘Velocipedes’ or ‘Ceir Gwyllt’ and there were two types of ‘wild car’, the hand operated ‘Ceir Troi’ and the treadle operated ‘Ceir Cicio’. The Velocipedes were jointly owned by groups of workers and theoretically carried 16 men, although a few extra often managed to hang on. Speeds of up to 40 mph have been claimed. There were eventually 52 of these machines and one of each type is now preserved in Penrhyn Castle Museum. Racing was forbidden but popular and therefore accidents were common. In the worst accident the wild car plunged into the lake with loss of life. The workmen’s train of 23 carriages (including one spare) first ran in 1895 (46 years after the railway opened). The carriages are believed to have been obtained second hand from the Taff Vale Railway and were regauged at Gloucester. Each four-wheel coach seated sixty men in six compartments. So on Monday morning there might be over 1,300 passengers (including up to 120 men from Anglesey who crossed on the ferry from Moelydon to Felinheli and stayed in the quarry barracks during the week). The train of five coaches (seven on Mondays) left Penscoins (at the top of the incline from Port Dinorwic) “one hour and thirty minutes before the first Quarry Whistle” for the seven mile and 45 minute journey to Gilfach Ddu. Extra carriages were added en route, four at Bethel, seven at Pont Rhythallt and four at Penllyn. The men had to push the carriages by hand out of the siding and couple on to the back of the train and on the return they had to uncouple and push the coaches into the siding. The return train left Gilfach Ddu “thirty minutes after the last quarry whistle” Men travelling all the way paid 2/6d per month, those joining at Penllyn paid 1/3d, and the Anglesey men paid 1/- per month (for 4 or 5 return trips). Each man received a brass disc with the coach letter and the seat number (probably the only workmen’s service ever with reserved seats). The train continued to run until November 1947 when it was withdrawn. Over the years the number of quarrymen travelling on the train declined and latterly only three coaches were needed owing to the greater speed and convenience of the bus service (despite the higher fares). In its prime, all aspects of the railway and tramways were maintained in first-rate condition. The main line track, for example, was examined every morning by three trackmen who each walked one third of the line before the morning workmen’s train. Following the closure of the railway and the quarry, the level four foot trackbed of the railway from Gilfach Ddu, along the side of Llyn Padarn to Penllyn was re-laid to 1ft 10¾ ins gauge and reopened by Rheilffordd Llyn Llanberis as a tourist railway using three of the small quarry locomotives. Across the valley on the southwest side of Llyn Padarn at Llanberis were a separate group of ten much smaller, independently operated slate quarries. These operated mostly on the lands of the Ruthin Charity Trust and the earliest was first worked c1700 and continued in operation until 1930, its neighbour was the last to close in 1931. They had formerly sent their output to Caernarfon by road (horse drawn carts) until the building of the L.N.W.R. Llanberis branch line in 1869, when transport costs were halved. Slate quarrying in the Nantlle region was in progress before 1750. The area has many relatively small quarries that were eventually served by several different railway systems. The Nantlle Tramway was designed and built by Robert Stephenson (brother of George) originally as a plateway that at a late stage in construction became a tramway to a nominal 3ft 6ins gauge with double flanged wheels loose on axles. The line opened for traffic from the quayside at Caernarfon to Talysarn in 1828. It originally served the Talysarn, Cilgwyn, Dorothea, and Cloddfarlon quarries and later the Penyorsedd quarry. In 1867 the Nantlle Tramway was amalgamated with the Caernarvonshire Railway and was for the greater part converted to standard gauge. The original feeder lines from Talysarn to the quarries remained as horse drawn 3ft 6ins gauge tramways and subsequently became part of the LNWR, LMS and eventually BR., until they were finally closed in or about 1963. In my railway accounting days at Crewe, I recall seeing hundreds of wagons listed as assets in the BR (LMR) accounts! Later, on a visit, I was surprised at the primitive design – unchanged for a 150 years. The inclination of the slate strata in the Nantlle district mostly required the excavation of deep vertical pits of slate. These filled with water and thus required pumping. At the Dorothea Quarry is a large and very deep pit that has at its bottom a very deep freshwater lake. There are characteristics in respect of this location and lake that make it particularly suitable and attractive for the sport of diving. Efforts are currently being made by the owners to secure funds to enable the provision of proper facilities for diving with trained rescue and recovery services on hand. Meanwhile, unauthorised diving in this lake, without adequate facilities, has resulted in many accidents and some fatalities in almost every year since the quarry closed. The North Wales Narrow Gauge Railways – Moel Tryfan Undertaking was a 1ft 11½ ins. gauge line designed and promoted by Charles Easton Spooner the Chief Engineer of the Ffestiniog Railway opened in 1877 from Dinas (south of Caernarfon) to Tryfan Junction and Bryngwyn. At Bryngwyn, a gravity worked incline ascended at a gradient of 1 in 10 was owned and operated by the railway company. Radiating out from the drumhead were branch lines in the ownership of the various quarries that had linked their internal systems to the railway. These branches eventually served Alexandra, Moel Tryfan, Braich, Fron, and Cilgwyn quarries. Thus, from 1923, Cilgwyn was linked to both the Nantlle 3ft 6ins gauge tramway (then owned by the LMS) and to the Welsh Highland Railway (formerly NWNGR). When the Welsh Highland Railway closed in 1936, only Moel Tryfan and Cilgwyn were still open. Yet a third railway served a few outlying quarries to the south of the main Nantlle system, this was the horse drawn 3ft gauge Gorseddau Tramway, which started before 1845 as the Tremadoc Tramway between the township and Portmadoc Harbour. This line was extended in 1856 to serve the Gorseddau slate quarry – 8 miles north of Portmadoc. In 1872, this line was reconstructed to 1ft 11½ ins. gauge and incorporated as the Gorseddau Junction and Portmadoc Railways Company serving Ynysypandy, Braich, Gorseddau, Dol-Ifan-Gyfyng, the Cwm Dwyfor Mine and the Prince of Wales Quarry. Unfortunately, the poor quality of the slate at these quarries led to their early demise. They have left behind evidence of the grand scale in which they were planned. Firstly, at Ynysypandy is the ruin of a massive three-storey mill incorporating a large water wheel and intended for the manufacture of slate slab products from Gorseddau and from the lack of waste it is clear that the mill was little used. Secondly at Treforys in Cwmystradllyn are the ruins of eighteen pairs of rather grand suburban semis laid out along three roads complete with marked out garden plots. All clearly shown on aerial photographs. The Ffestiniog ‘grey’ volcanic mudstone slate mined deep inside the mountains in the Ffestiniog area is the odd one out. It is a relatively soft Ordovician slate, easy to work and to carve and can even be turned successfully on a lathe. It possesses excellent cleavage and produces some of the thinnest high quality roofing slates in the world. After the early 19th century fire of Hamburg (following which the use of wooden shingles was forbidden there) these slates were exported from Portmadoc to Germany in large quantities. These notes on Ffestiniog slate and railway draw to a degree on my own compilation and that of my associates in the Ffestiniog Chronology. From 1684 or earlier, in the Ffestiniog area, men called slaters had undertaken building and repair work using slate that they had extracted from the hillsides on common land. However, the first recorded organised slate quarrying at Ffestiniog appears to have been (c1755-65) by Methusalem Jones, a quarryman from Cilgwyn, Nantlle, who was aware of the vast slate deposits that existed at Ffestiniog. He opened a small open quarry at Diphwys/Duffws on Lord Newborough’s Peniarth estate and this quarry was subsequently worked by partnerships of men mainly from Cilgwyn. Many more quarrymen moved from Cilgwyn to Ffestiniog during the second half of the eighteenth century. The Diphwys quarry was sold in 1799 for £14,000 to William Turner (from the English Lake District) who was financed by the Casson brothers. Later, c1790, Lord Newborough opened Bowydd (later Votty & Bowydd) quarry to the west-southwest of Diphwys. These were the first significant workings of Ffestiniog Slate. Other names would quickly follow as the landowners began to cash in on the roofing material beneath their feet. In 1810, landowner Evan Owen with 17 men began production at Rhiwbach quarry four miles east of Diphwys and high in the mountains at about 1,300 feet. It is in Penmachno parish and had already been worked spasmodically by slaters, including those who had re-roofed Ysbyty Ifan church in 1774. The quarry at Rhiwbryfdir Farm, on the Dinas estate owned by W.G. Oakeley of Plas Tanybwlch and first worked around 1814, was leased to Samuel Holland, who was to become one of the promoters of the Ffestiniog Railway. Holland soon sold his original lease to the Welsh Slate Company and opened a second quarry on the Oakeley estate at R’Allt Fawr (Cesail) higher up the mountain. The third Oakeley quarry lay between the two and was opened up by the Rhiwbryfdir Slate Company. These three Dinas quarries were destined to become the largest slate producers in the Blaenau Ffestiniog area. In 1883, the Welsh Slate Company suffered a disastrous roof fall owing to their bad working practices, and 6¼ million tons of overburden collapsed into their workings. Following a long and acrimonious legal battle, title to the Welsh Slate Company assets passed to Oakeley in compensation for losses to the upper quarries, which had previously reverted to Oakeley. By 1830, the slates from the three main Ffestiniog quarries (Diphwys, Bowydd and Rhiwbryfdir) were being carried for two miles in panniers on the backs of ponies or mules to Congl y Wal (mid-way between Duffws and Ffestiniog village) and then on carts hired out by local farmers, through Ffestiniog and down 700 feet over rough and muddy roads to small quays on the Traeth Bach along the shores of the of the Afon Dwyryd below Maentwrog. Small boats, each carrying 6 tons, and operated by boatmen known locally as Philistines and who came from Llanfiangel y Traethau or Llandecwyn, took the slates to the exposed anchorage of Ynyscyngar for a third trans-shipment to sea going vessels bound for Liverpool. Cost of transporting one ton of slate to this stage was 15s 6d, it having cost around £1 to quarry and dress. Ffestiniog quarries were therefore at a serious disadvantage with the other major slate producing areas of North Wales (Penrhyn, Dinorwic and Nantlle), which, by 1828, were all served by tramways to the sea.. The year 1831 was to see the repeal of the duty on slate, and an explosion of demand. First proposed in 1824 by Wm Madocks who died in 1828, then by several others, the Festiniog Railway Company was promoted by Samuel and Wm. Holland, and Henry Archer. Archer raised the original capital in Dublin, and the company (after much local opposition) was finally incorporated by Act of Parliament in 1832 and the railway opened in 1836. The railway initially cost £42,000 to build and subsequent improvements (including, in 1844, a 730 yard tunnel under the Moelwyn range and the later introduction of steam engines) added a further £100,000 to the capital costs. The Festiniog Railway Company, incorporated in 1832, is now, as it has been for many years, the oldest railway company in the world still operating under its original charter of incorporation. This unique distinction, if once lost, could never be regained. It is a responsibility of which the present Trustees are very conscious. Despite the obvious advantages, the Ffestiniog slate producers were strangely reluctant to use the railway. Notwithstanding incentives such as grants to meet the costs of connection (building inclines) and the provision by the company of free slate wagons for the journey to Portmadoc, and even though the charge was 6/- per ton compared with over 15/- per ton by packhorse, road and river, some quarries were not connected to the railway until 1843 (seven years after it had opened) by which time the railway charges had dropped to 4/3d per ton and slate production had risen quickly to 44,000 tons per annum. By 1862, the population of Portmadoc had risen to 3,059 and slate traffic on railway had grown to 54,343 tons. About 1845, John Greaves bought land at Llechwedd (across the valley from Oakeley Quarries) and this new site subsequently became one of Blaenau Ffestiniog’s more profitable quarries (second only to Oakeley) and it is one of the last producers. Since 1972 it has also been the site of an impressive tourist facility. Although usually called quarries, most Ffestiniog slate is mined underground. At Quarry Tours Llechwedd, in addition to the ever-popular demonstrations of slate splitting and the usual display of ancient artefacts, tourists are taken underground in two different tours designed to show something of the methods formerly used. Firstly they are driven slowly in an electrically propelled train through a series of underground caverns on a fairly level route. Secondly they are taken deep into the bowels of the quarry riding down an inclined plane, from the bottom of which they take a walking tour. Today, a private road connects Llechwedd, Maenofferen and Cwt y Bugail and the remaining production is transported by road. Formerly, Maenofferen, Cwt y Bugail, Blaen y Cwm, and Rhiwbach quarries were served by the Ffestiniog Slate Company’s Railway, which ran from the summit of the second incline (of the three inclines rising from the FR Duffws station) along the shore of Llyn Bowydd (altitude of over 1,500 feet) and for a total of about four miles to Bwlch y Slaters (Manod) quarry. Other slate quarries served by connections to the Ffestiniog Railway included Moelwyn Mawr, Moelwyn Bach, Wrysgan, Conglog, Glanypwll, Tal y Waenydd, and Hafoddty. The FR also served the Moelwyn zinc-mine and the Moelwyn Granite Quarry. By 1871, there were 33 quarry inclines and 14 miles of quarry track connected to the FR. Thus the internal quarry mileage surpassed, very slightly, the main line mileage of the FR. By 1873, the railway slate tonnage for the year had reached 144,091 tons; 116,576 tons for onward transit from Portmadoc by sea, 19,088 tons for onward transit by rail from Portmadoc and 8,427 tons for transit by rail from Minffordd. This was about the highest tonnage carried in any one year. Following the introduction of steam engines, it became possible to operate passenger services and the FR introduced in 1865 three classes of passenger traffic, 1st, 2nd, and 3rd plus in February 1867 special quarrymen’s trains and fares. At first quarrymen’s trains operated only on Monday mornings from Portmadoc at 6 am to Blaenau and returning on Saturday afternoon at 4 pm. Quarrymen travelled in primitive fully open 4 wheel coaches. In 1875, quarrymen’s coaches were fitted with roofs. By popular demand in February 1881 the quarrymen’s train ran daily. The Ffestiniog Quarries were not slow in the introduction of mechanisation and developed the use of hydraulic rock-drilling machines. They were also early users of electricity for lighting, water pumping and for haulage on those inclined planes where counter-balanced gravity could not be used. Llechwedd Quarries introduced DC supplies in 1904 and its power station was still in use in the 1980’s. The Vale Power Co. of Tanygrisiau supplied the Votty quarry and the local townships. While Oakeley Quarries installed an AC supply in 1906 in a joint venture with the North Wales Power & Traction Co. whose Cwm Dyli Hydro-electric power station in Nant Gwynant still supplies electricity to the National Grid. The Croesor group of quarries also exploit the Ffestiniog slate deposits. These quarries were linked to Portmadoc in 1864 by the 1ft 11½ ins. gauge horse-drawn Croesor Tramway built by Mr H.B. Roberts. It continued to operate by horse traction under various ownerships until, in 1921; about half the line was incorporated in the Welsh Highland Railway. The Croesor line served Park, Fron-boeth, Pant-mawr, Croesor, and the New Rhosydd and Rhosydd Quarries. All these quarries relied on underground mining to an even greater extent than the Ffestiniog quarries. Such is the location of Rhosydd quarry high above Cwm Orthin, that prior to 1864, its slate was transported by pannier ponies along bridle ways to the Ffestiniog Railway at Tanygrisiau. With the construction of the Croesor Tramway, the way was open for a massive expansion at Rhosydd and a 700ft incline was built down to the valley floor and connected to the tramway. In the hey-day of production, the Croesor quarry, under its progressive Engineer and Manager, Moses Kellow, employed the latest available methods, including the installation of its own hydro-electricity generating plant in 1902 (alternating current). He even used electric locomotives fed from overhead power lines within the mines. He had the reputation of being a fine engineer, but he was less effective as a businessman, and by 1930 slate extraction at Croesor had ceased never to be resumed. Horse traction, at least for part of the way – between the quarries and Croesor Junction continued until the end. The line remained available for use throughout the war in the hope of revival of slate production. The tracks were lifted in 1949. During the war, Croesor underground workings were leased by ICI for use as warehousing for the high explosives produced at Penrhyndeudraeth. After the war, surplus and potentially unstable stocks appeared to have been retained in store at Croesor, unknown to the engineers and planners who built the Tanygrisiau power station. An explosion would have been disasterous and the power station was closed with reduced water levels until the explosives had been removed and transported elsewhere. By 1882, both the LNWR and the GWR had built their branches to Blaenau Ffestiniog and were providing competition for the FR. The LNWR had a competitive advantage as far as traffic to Northern England was concerned and even attempted to compete with the FR sea-borne traffic by offering port facilities at Deganwy. The GWR in fact carried little slate from Blaenau but actually, with the decline of the sea-borne traffic, increased its tonnage from Minffordd and Portmadoc. Even down to 1939 when passenger trains ceased in September, the FR had managed to retain market share, as they say, of a much reduced and reducing slate market. The FR continued throughout the war with slate traffic mainly to Minffordd, and such freight traffic as presented itself until 1st August 1946, when the railway ceased operations (except in Blaenau Ffestiniog itself). The last known consignment of slate by sea was taken from Portmadoc in June 1946. Until the early 1960’s, the slate wharves at the Minffordd exchange sidings continued to receive slate from Blaenau Ffestiniog for onward distribution by British Rail, but it was delivered to Minffordd by road. Slate trains using FR owned wagons continued to operate over the FR line from 1946 onwards through the centre of Blaenau Ffestiniog between Duffws and the LMS slate transhipment yard until the late 1960’s and produced a small income for the FR Co.
5. Development in the late 19th century of slate quarrying overseas, especially in USA, together with high transport costs lead to the fall of the overseas market. 6. Two world wars destroyed the overseas markets almost totally. Exceptions being specific orders to carry out restoration work, as in the case of Charleston USA, where in 1970’s, following massive hurricane damage, the civic authorities decreed that restoration should be carried out with matching Ffestiniog slate. 7. The switch of the domestic market to earthenware tiles and similar cheaper and lighter materials for most new building work reduced the market for slate to that needed for repair work and for use in conservation areas. 8. To a large extent the industry failed because costs rocketed owing to the inability of the industry to maintain, let alone increase production. Production had plummeted during the war and never recovered. The quarries were unable to absorb the overheads of an infrastructure far larger than the current much reduced levels of production and demand could justify. The industry was labour-intensive, highly skilled and impossible to mechanise. A minimum of ten tons of waste to every ton of dressed slate was proving increasingly difficult to manage. 9. At Blaenau Ffestiniog in particular there was a dearth of skilled miners and rockmen (Blaenau quarries need both skills). Some quarries closed simply because their last rockman had retired and could not be replaced. Large quarries that in the hey-day had employed perhaps a thousand men were reduced to less than a hundred and were unable to employ more, despite full order books, owing to the lack of skilled rockmen or miners. One skilled rockman could ensure work for 30 to 50 others including many who were themselves skilled in the finishing trades. Men with these finishing skills were also in short supply. 10. In the mid 1970’s, the Ffestiniog Railway employed three Cornish mining engineers, graduates of the Camborne School of Metalliferous Mining (University of Exeter), men accustomed to working all over the world, they came on an 18 month contract to dig a new tunnel through the Moelwyn range – they were assisted by 12 locally engaged labourers and a number of FR staff and volunteers. There was criticism in some circles because local skilled labour was not being used. That had in fact been the original plan – until the railway learned that were it, at that time, successfully to recruit such highly skilled men locally, it would effectively close the Ffestiniog slate industry completely with the loss of several hundred jobs. 11. All the quarries produced slate waste of over ten times the volume of the dressed slate produced. Major proposals of the 21st century include the imposition of a government levy of £1.60 per ton on aggregates, but with full exemption for the slate industry in order to finance the clearance of slate tips (by sale of slate waste for re-use). In the rebuilding of the Welsh Highland Railway from Caernarfon to Porthmadog, the FR Co. is pioneering the use of slate waste as a foundation material (below the normal granite track ballast) in places where the track height needs to be raised above the natural drainage level. Many highway engineers are now looking at schemes for the use of slate waste and this is cause for concern at Penmaenmawr. It is difficult to see how the slate tips can be removed so completely that the effect on the landscape will be beneficial. This industry has also had a remarkable effect on the landscape. Prior to the development of stone working, Penmaenmawr, as a community, did not exist. The coastal plain was given over entirely to agriculture and only the hamlet of Dwygyfylchi at the foot of the Sychnant Pass offered hospitality. Here ancient man had developed stone axe making into a major industry. In early Victorian times, stone working developed as a cottage industry on the foreshore at Penmaenmawr with the discovery that the local granite, forever falling from the cliffs above, could be fashioned into desirable road paving blocks. By their own admission, the Penmaenmawr and North Wales Granite Co. Ltd., from these modest beginnings, had managed to reduce the height of the granite mountain from 1,550 ft. to 1,370 ft in their first 120 years (down to about 1960) at which time they were quarrying up to 3,000 tons per day. Much of the success of these quarries can be attributed to Colonel C.H. Darbishire who was a fine engineer and also ‘an enlightened employer, enjoying a high public regard and the loyalty of his labour force of 1,100 at Penmaenmawr.’ In addition to roadstone, coastal defence works, and building aggregates a major output has been railway ballast with the proud claim: ‘A full trainload of railway ballast has left Penmaenmawr every working day since 1889.’ The Welsh Highland Railway is a recent customer. Almost as common as slate quarries but much less intrusive are the electric power stations of Snowdonia. The first hydro-electric plants had the slate industry among their larger customers and developed because of slate. Much more recently, the now redundant nuclear power station at Trawsfynydd has dominated the skyline as viewed from the Ffestiniog Railway for fifty years and following its closure threatens to force on the area an enormous dump for nuclear waste, the size of a football stadium. The Tanygrisiau Pumped Storage Power Station with its extensive reservoir in the Ystradau valley also has the Stwlan high dam, gleaming white and visible for miles. At Llanberis, the very much larger ‘Electric Mountain’ Pumped Storage Scheme which has, following a New Zealand example, hidden the power station within the mountain uses the existing high reservoir of Marchlyn Mawr as its upper reservoir and Llyn Peris as the lower reservoir. Both these projects attracted considerable public interest and have developed into major tourist attractions. There is still potential for small power stations that are quite unobtrusive, for example the very small SWALEC / Welsh Water, Cwmorthin Hydro-electric power station built in 1996 near to the FR Tanygrisiau station. Several hydro electric power stations survive from the late 19th century and early 20th century, including the Cwm Dyli and Dolgarrog installations of the North Wales Power & Traction Co. that supply electricity to the National grid and also the Aluminium Corporation whose works (built to use the cheap hydro-electric power) are currently under threat of closure. In the main, the hydro-electric power stations are not obtrusive but the same cannot be said of the very visible high-tension power lines. Festiniog is connected with the rest of the world by a wonderful little line of railway .... There is nothing finer in all creation than the scenery at and near Portmadoc and especially on the Festiniog line. The valleys are inexpressibly charming, and the line is in many places very like indeed to some portions of the Mont Cenis Summit Railway. …. The estuaries of the Glaslyn and Penrhyn present pictures of loveliness not to be surpassed in any part of the world. Not even the Vale of Turin, descending from the Alps, can surpass the beauty of these lovely valleys, …. the view from the embankment at Portmadoc with the peak of Snowdon towering in the background, the placid estuary in front and the framing ranges of rich-mottled “everlasting hills”, furnished a picture that is ravishing to look at – an impression to be cherished, that can never be lost or forgotten. …. (then follows several pages of detailed description of the line) …. We arrive at Blaenau Ffestiniog, and the end of our ride on Little-gauge railway No. 1 …. 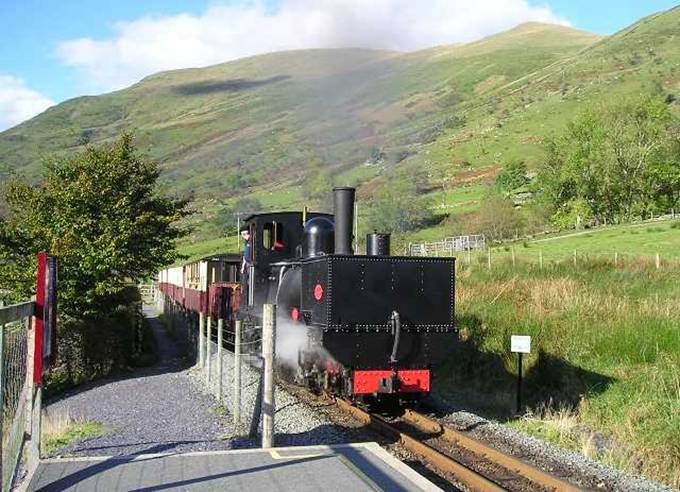 If we wish to reach Festiniog village we have still four miles to travel, on Little-gauge railway No. 2. There was also the publication of a commercial picture postcard pre-1883 with the legend “2342 An engine on the Toy Railway, Blaenau Festiniog” and showing a locomotive on the independent and short lived Festiniog and Blaenau Railway (little-gauge railway No. 2 above) connecting the FR at Duffws with the Manod quarries and the old village of Ffestiniog. The Festiniog and Blaenau Railway opened in 1868 and became part of the Great Western Railway (Bala & Ffestiniog branch) in 1883 when it was converted to standard gauge. An FR poster of 1931 (one of many) urged travel by ‘The First Toy Railway ever Built’ and offered two trains per day in each direction (Monday to Friday) between ‘Portmadoc, Maentwrog Valley (Tanybwlch) and Blaenau-Festiniog’. The same poster also advertised ‘Magnificent Road & Rail Circular Tours in conjunction with Crosville Road Motor Coaches’ So the label ‘toy railway’ seems often to have been associated with the Ffestiniog Railway, which is arguably the most professional of all the British narrow gauge railways. I felt the above worth a mention because my Grandmother often talked pleasurably of the Ffestiniog Toy Train. Happily, for most people locally, it is, as it has always been, Y Trên Bach. During the nineteenth century, all the major quarries of North Wales were connected by narrow gauge railway to the sea and later to the national railway network. One of these connecting narrow gauge railways, the Ffestiniog Railway stood out from the rest and, especially in the nineteenth century, was attracting major international interest. On its closure a great many people had hoped that somehow the line might be saved. In undertaking to submit something on the railways of the slate industry, in the context of impact on the landscape of Snowdonia, I realised that the railway impact, like industrial impact generally, is extraordinarily dependent on people and this continues to the present time. The whole of Ffestiniog should be grateful to Henry Archer (a Dublin lawyer) for being in the right place at the right time. It was at the Penygroes Inn in 1829 that Archer met Samuel Holland Jnr., of Rhiwbryfdir and Plas yn Penrhyn who was returning from Caernarfon where he banked with Williams and Co. He had travelled between Caernarfon and Penygroes as a passenger on the horse drawn Nantlle Tramway and had called at the Inn for a cup of tea before collecting his horse and riding home. In conversation, Archer expressed an interest in the Nantlle Tramway that was apparently quietly seeking a purchaser. Holland, it is said, suggested that Archer should leave Nantlle to its fate and turn his energies to building a proper railway from Ffestiniog to Portmadoc. A detailed discussion followed and Archer became involved with Holland in the promotion of the FR Co. It was left to Archer as the Managing Director designate to raise the financial backing on the Dublin Stock Exchange (including £11,905 of his own money). Archer remained as Manager until 1856 and in 1860 the FR Co. gave him a pension of £100 per annum. In railway circles, Archer is known mostly for the Ffestiniog Railway, a fiery temper, a large frame and an even larger personality. A few will recall his long running but fruitless championship of the various Porth Dinllaen projects. However, philatelists the world over know Henry Archer as the inventor of those little perforations that separate one postage stamp from the next. He also invented the perforating machine and in 1848 sold the patent to the Postmaster General for £4,000. James Spooner was born at Leigh near Worcester in 1790, he trained as a land surveyor and is believed to have worked as a civilian member of an Ordinance Survey team. He married in 1813 and his first three children were Matthew, James Swinton, and Caroline. From 1818 to 1824, they lived at Maentwrog where Charles Easton, Louisa, Thomas and Amelia were born. When the North Wales survey was completed in 1823, Spooner, with his growing family, stayed and worked as a freelance surveyor. In 1825, Spooner took a lease of Wm. Madocks house Tanyrallt Isa at Tremadoc where Elizabeth and Harriet were born and Caroline was accidentally shot dead by Matthew. Finally, the family moved to Morfa Lodge in Portmadoc where William was born in 1834. Spooner was already well established as a local surveyor and he had surveyed inclines and a tramway (never to be built) from the Moelwyns to Portmadoc via the Croesor valley, when, in 1830, Archer, on Holland’s advice commissioned him to survey a suitable route for the FR. Holland also suggested that Spooner engage the services of an engineer to assist. Thomas Pritchard (Welsh speaking and at that time in Anglesey, where Dr. Lewis thinks he may have been working with a contractor on Telford’s road works) was engaged to assist with the project as resident engineer during the planning and throughout the construction at a salary of £65 per annum. Pritchard stayed with the FR for several years after the completion of the line – probably until Charles Easton was able to take over from him. James Spooner’s part-time consultancy fees in 1830 were £100 per annum. James Swinton and Charles Easton both assisted their father in the survey. The survey completed, Spooner and Pritchard walked the route with Robert Stephenson and gained Stephenson’s full approval for their plans. There has been much confusion and discussion concerning the Robert Stephenson involvement. The elder Robert Stephenson, who was the younger brother of George, surveyed and laid out the route of the Nantlle Tramway c.1825 and, especially in recent years, it has generally been thought that he was the inspector of the Ffestiniog route. However, Dr. M.J.T. Lewis argues convincingly (on the basis of the published content of Stephenson’s evidence to the Parliamentary Committee in 1832) that it was indeed George Stephenson’s distinguished son Robert who advised the Ffestiniog promoters. The history of the FR at this time is very dependent on Samuel Holland’s memoirs and Dr. Lewis has recently pointed to many inconsistencies therein. It is probably to the Stephensons that we also owe thanks for the ‘horse dandy’, that peculiar FR practice (at one time apparently used in Northumberland) whereby the horse, having fought against gravity for twelve long miles hauling empty slate wagons from bottom to top in four or five hours, was rewarded with a bag of oats and a high speed (100 minutes) ride from top to bottom behind eighty loaded slate wagons and propelled by ‘that very same gravity against which he had for so long toiled upwards’ – as a contemporary report put it. The FR Trust still owns an original ‘horse dandy’ and other artefacts of that era, and of course the famous hearse. There are also fine archives covering the entire history of the line. Charles Easton Spooner succeeded his father on his death in 1856 and dominated the FR management and engineering until his health began to fail in 1887. It was he who engaged Charles Holland (Samuel’s nephew) to design the first six small engines built by George England for the FR. When the first engine was ready for delivery, a special cart, to be pulled by a team of horses, was built and in that way the engine was brought by road from Caernarfon. The first four engines required significant modification in the light of experience. Later engines were delivered on the newly opened Cambrian Railways to Minffordd where Spooner had laid out a pattern of exchange sidings that were the inspiration of many visitors from abroad. Charles Easton also brought the world to Portmadoc for the locomotive trials of 1870 and through his writings promoted narrow gauge railways throughout the world. Other Spooners made their mark. James Swinton Spooner, an elder brother of Charles Easton, was the engineer to the Talyllyn Railway. George Percival Spooner (son of Charles Easton and a graduate of Karlsruhe Polytechnic) remained with the family firm and designed fine engines for the FR and other railways. The FR Carriages Nos. 15 & 16 were built in 1872 to his design by Brown Marshalls & Co. Birmingham. They were the first bogie passenger carriages of any gauge to run in the United Kingdom. These historic carriages, the forerunners of all the carriages now running on British Railways, are still in use, and were fully restored last year with the aid of a grant from the Heritage Lottery Fund. In 1879, George Percival was exiled to India (owing to the pregnancy of Eleanor Davies, one of the servants) where his career blossomed and he eventually became Locomotive Superintendent of the Indian State Railways. Unfortunately, he was not a businessman and lost most of his money. He eventually returned to England, becoming a Special Constable at Kings Cross during the war. He died in 1917. Charles Edwin, youngest son of Charles Easton was resident engineer of the North Wales Narrow Gauge Railways during construction. Afterwards he had a distinguished railway career in Malaya. In 1956 Thomas Spooner Lascelles (who died in 1960) presented to the FR Society a framed portrait of Charles Easton Spooner and also George Percival Spooner’s leather bound album – a most valuable archival collection of professional photographs. Also entrusted on that occasion to the Society was the letter written to C.E. Spooner on May 8th 1871 by Count Alexei Brobinskoi of St. Petersburg. Charles Easton Spooner was a Victorian ‘family man’ and he established his family at Bron y Garth where in 1869 he built a garden railway for the entertainment of family and friends. Such a feature was an undoubted novelty at that time. The brass trackwork and the engine and rolling stock were all made in the FR works at Boston Lodge (where the surviving track is now stored). ‘Topsy’, the famous 3¼ inch gauge model of an England engine was built at Boston Lodge by W. Williams, Works Engineer and it was thought to have been lost. However it was discovered and brought to Porthmadog Harbour Station in 1963 by Nicholas Knight (with family connections) and it is now on display. This is the earliest known model of the first narrow gauge locomotive in the world and is the real ‘toy train’ of Snowdonia. In 1998, the Ffestiniog and the Welsh Highland Heritage Groups together undertook the restoration of the Spooner Family Grave in Beddgelert Churchyard. This consists of a large double plot with two carved slate memorial tops surrounded by iron railings, which had been specially made in the Ffestiniog Railway Boston Lodge works. One stone commemorates Charles Easton Spooner and his eldest son John Eryri, the other his wife Mary, with their infant son James and their daughter Mary who died aged five of bubonic plague. A separate grave along side the first is that of the nurse Elizabeth Preece who cared for Mary and who herself died of the plague two days later. The restoration work, which involved heavy weed clearance, the cleaning of the stones, and the rust proofing and painting the railings, caught the attention of CADW, resulting in the graves now being listed as grade 2 monuments. The Ffestiniog Railway slate trains ran from Blaenau Ffestiniog to Portmadoc by gravity, it being a continuous descent all the way at a gradient of about 1 in 70. Trains of 80 wagons or less were manned by two brakemen but longer trains were normal and were manned by three men. The journey took about 1¾ hours to Boston Lodge and the loaded wagons were hauled across the Cob by horses or locomotives. This efficient method of operation for very long loaded slate trains continued until 1939. Empty slate wagons were hauled back by horses and this was a slow and inefficient operation. It was this mode of operation that dictated the Ffestiniog practice, still observed, of passing on the right. By the early 1860’s traffic was beginning to outstrip the capacity of the line and the decision was taken to introduce steam engines. This was against the advice of Robert Stephenson and other eminent railway engineers (the general opinion being that the track gauge of 1ft 11½ ins was too narrow for successful steam operation on a line of such length). The first six engines were built to the design of Charles Holland, the nephew of Samuel Holland (tenant of W.G. Oakeley’s Cesail Quarry). The first steam hauled empty wagon trains ran on October 23rd 1863 – Six trains ran daily; 1 hour 50 minutes trip each way; down slate trains continued to be worked by gravity, with the locomotive following on behind. Passengers were carried from 1865 onwards with five trains per day in each direction and these continued with various levels of service until September 1939. Goods wagons and empty slate wagons were hung on the back of ascending passenger trains. Descending slate continued to operate by gravity until 1939. The first seven engines for the FR were built by George England at his Hatcham works in South London. There were Holland’s six small tank engines and later Robert Fairlie’s remarkable ‘patent double-engine’ named “Little Wonder”. This engine astounded the railway world of the 1870’s with astonishing feats of haulage on the narrow gauge line. Fairlie was a great showman and made the most of the opportunity. However, Robert Fairlie’s professional career and social standing had been seriously threatened eight years earlier by a remarkable case (reported in the Times of April 8th 1862) brought against him in the Central Criminal Court by this same business associate, George England, who alleged perjury on the part of Robert Francis Fairlie who had eloped with England’s daughter Eliza Anne England and, in order to procure a marriage licence, had sworn a false affidavit that her father, Mr George England, had consented to the union, which was not true. After this marriage they had run away to Spain. But, business is business, and none of this stopped George England building Robert Fairlie’s remarkable double-engine for the Ffestiniog Railway seven years later. By 1881, George England was dead and Robert Fairlie and his wife Eliza were living at 13 Church Buildings, Clapham with their four children, Robert, John, Lily and Jessie and Robert’s mother in law, Sarah England, together with Francis Knight (cook) from Norfolk, also four domestic servants and Emma Bermoker (possibly an au pair or governess) from Vevey in Switzerland. The Duke of Sutherland; Mr W. T. Mulvany, overlooker of certain mines in Prussia; M. Tolme, engineer; M. Phillippe Kremer, Paris, engaged on the Moscow and Novogorod Railway; Mr Christer P. Sandberg, Swedish Consulate, London; Count Czheni, Russia; Count Alexander Berg, son of the generalissimo of the Russian army, and Viceroy of Poland; Count Bobrenski (Bobrinski), Russia; Count Tamoyski, Hungary; Jean Roetrsberg (Roshesberg), Director of the Moscow and Novogorod Railway; Basiley Saloff, Professor of the Imperial Institute of Engineers, St. Petersburg; Charles de Schouberszki, director of the Kourst and Harkof Railway, Russia; Count Ivan Tlabroburr, Moscow; Count (M. Robert) von Desen, St. Petersburg, in the engineering department of the Russian empire; L. de Kislankske, of the Imperial Institute, St. Petersburg; Mr Preston, Chester, solicitor to the London and North Western Railway Company; Capt. Tyler, Government Inspector of Railways; Messrs. Edward and E. S. Preston, Clifton; Mr Preston, engaged on the railway from Tiflis to the Caucasus, in Turkey and Russia; Gen. Sir William Baker, K.C.B. ; Mr Power, M.P ., connected with the management of the Mexico and Vera Cruz Railways; Mr Pille, Sweden; Mr Ayrton, Mr Elias, general manager, Cambrian Railways; Mr Poole, local traffic manager ditto; Mr C. E. Spooner, engineer, Festiniog Railway Company; Mr Crawley, C.E., London; Mr Fairlie, C.E., ditto; Mr Danas, Indian Railways; Mr C. Thornton, ditto; Mr Livingston Thompson, Chairman and Managing Director, Festiniog Railway Company; Mr Dallas, “Times” newspaper, and Mr Thomas Cargill, engineer & reporter of the Engineering Gazette. The commissioners arrived at the Portmadoc station at two o‘clock on Friday evening last (11th Feb), in four splendid carriages, three of which had been kindly supplied by the London and North Western Railway Company, and are used to convey the Royal Family when they travel by rail; the other being the private travelling carriage of the Duke of Sutherland. After partaking of luncheon at the Sportsman Hotel, Portmadoc, the whole of the party proceeded to the Festiniog Railway Station, where Mr Spooner and Mr Pritchard had prepared everything ready for the trip up the line to Festiniog, they entered the unique and curious looking carriages; and at 20 minutes past 3 o’clock in the afternoon the train consisting of upwards of ninety-seven carriages, the whole train, headed by ‘Little Wonder’ the double-engine, being about 830 feet long, started for Blaenau at a rattling pace. [Note: The 97 carriages = 7 passenger carriages plus 90 empty slate wagons]. On Saturday morning the weather was intensely cold, “there being a gale blowing right from the east, and strange to say the Russian gentlemen appeared to suffer from it more than anybody else.” Trials continued on the Monday and the members of the main Russian Commission returned the following weekend with Mr Robert Fairlie for further tests with the ‘Little Wonder’ the remarkable double-engine. News of the tests quickly reached the USA and were extensively reported, even after seven years, by an entry in The Practical Dictionary of Mechanics (Houghton Osgood, USA 1877). Following the trials, C.E. Spooner published in 1871 Narrow Gauge Railways his famous work, of which two copies, bought in the year of publication are still held by the Library of Congress. Spooner’s ideas had a great influence on the building of the Denver and Rio Grande Railway as well as short lines in New England and elsewhere. Railways or No Railways – The Battle of The Gauges Renewed published by R.F. Fairlie in 1872 was also influential. Robert Fairlie’s patent locomotive was not the first articulated engine but it was the first successful one, and very successful it proved to be. Engines of these types (Fairlie produced single-engine as well as double-engine versions of his design) were built for service all over the world. 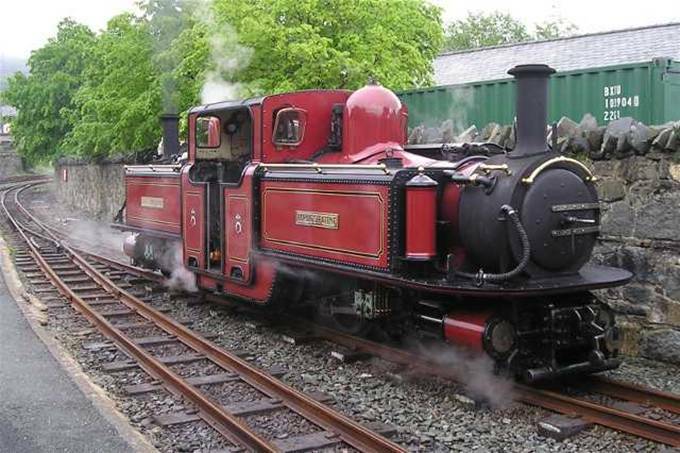 Robert Fairlie recognised the part played by the Ffestiniog Railway in promoting his double-engines by giving the FR the free use of his patents and the FR continued to build new engines to this design including this one ‘David Lloyd George’ built in 1990. The basic principles were adopted by others and notably the largest and most successful of all the articulated designs owing their inspiration to Robert Fairlie’s ‘Little Wonder’ were those of Mr H.W. Garratt that were first built by Beyer Peacock & Co. in Manchester in 1909 – the first of which is now being restored at Boston Lodge. Once the excitement of the Locomotive Trials had died down, the Ffestiniog Railway could and did settle down to the quiet business of simply getting better. With hindsight, everyone knew, indeed they had known from the start, the railway was meanly built. But Archer (the Managing Director, and the largest shareholder in 1833) had not been prepared to pay for anything better. The railway was too narrow, both in track gauge and in loading gauge. Likewise, tunnels and bridges were too narrow and far too low. To change these matters even in 1875 would be prohibitively expensive. So the railway set about with great success the work of improving its efficiency. In this the Company had a great ally in Captain Henry Tyler, the Board of Trade’s Inspecting Officer for Railways. Sir Henry Whately Tyler, 1827-1908. In 1964, Col. Robertson (HM Inspector of Railways), aware of the great interest of FR Society members in the personalities of the past put Michael Seymour in touch with Sir Henry’s grandson, Lt Col. Tyler who made available the memoirs of his Aunt, Miss M.L. Tyler (one of Sir Henry’s twelve children). A copy is held in the FR archives and an extract was published in the FR Magazine. He was appointed as an Inspecting Officer for Railways in 1853, inspecting new railways and investigating accidents. In 1865 he was asked to test and report on the Mont Cenis Summit Railway and Tunnel. In 1866 his inspection of the railway routes through France and Italy and his report to the Postmaster General on the available routes and ports, led to the adoption of Brindisi as the route for the Indian Mail. In 1867 he was engaged to investigate the water supply of the City of London following an outbreak of Cholera. In 1868 he retired from the Royal Engineers and spent two leave periods building the first railway in Greece from Athens to Piraeus. In 1871 he was promoted Chief Inspector of Railways. His annual reports, published as Blue Books, formed internationally recognised text-books of great value. In 1875-76 he was a leading and enthusiastic member of the Channel Tunnel Commission. Twenty years, twenty profitable years for the Ffestiniog Railway and its principal customers, in the slate industry. In 1872, the Avonside Engine Company built ‘James Spooner’ to the design of G.P. Spooner, an improved version of Fairlie’s patent double-engine. In 1876 the Vulcan Foundry built ‘Taliesin’ a much smaller single-engine of the Fairlie type. Also, the FR Co. workshops at Boston Lodge were well equipped and staffed and able to repair locomotives, coaches, and wagons and all else to do with the maintenance of the railway. The FR also built at Boston Lodge two Fairlie’s to G.P. Spooner’s improved design. The first was ‘Merddin Emrys’ built 1879 and the second ‘Livingston Thompson’ built 1884. Charles Easton Spooner retired completely in July 1889 and died that November. It was the end of an era. Spooner’s place was taken by J.S. Hughes, first as Secretary in 1887 and finally as Engineer & Manager in August 1889. In his turn Hughes gave way to Frederick Vaughan in1908, but the real change comes in 1909 with the retirement of William Williams as Locomotive Superintendent after 60 years service. Difficult years for the slate industry, followed by government control of the railway for the duration and the re-equipping of Boston Lodge Works as a shell factory manned by young ladies in mop caps. Things would not be the same again. Not that anyone expected the next big change. The Railways Bill received the Royal Assent on 19th August 1921. Just how the FR Co. managed to stay out of the amalgamations does not seem to have ever been explained, but David Lloyd-George PM 1916-1922 was a one time partner of W.R. Davies, Solicitor of Pwllheli whose family had a significant holding of FR shares. The FR Co. now has an engine, built new in 1993, that was named Dafydd Lloyd George by Dr. William George at Tanybwlch on 16th April 1993 in honour of his great uncle. Attempts, in 1947, by local interests and also by the shareholders to get the FR Co. included in the Railway Nationalisation Bill were, despite a total absence of opposition, quite unsuccessful. Today everyone is just grateful that the Festiniog Railway Co. (the world’s oldest surviving railway company) was kept out of both groupings. Mr Henry Joseph Jack (Chairman, North Wales Power & Traction Co.) stated in November 1921 to The House of Commons Committee investigating their proposals: “That the promoters of the Welsh Highland Railway had spent £40,000 in hard cash to purchase a controlling shareholding in the FR Co. in order to secure their co-operation in the promotion and future operation of the WHR as a complete and unified scheme.” Henry Joseph Jack, Chairman of the North Wales Power & Traction Company, was appointed Chairman of the FR Co. in June 1921. The other directors were Sir John Stewart and Evan R. Davies. From then onwards, the FR Co. was the effective operator of the newly formed and not as then completed Welsh Highland Railway. All senior staff appointments were jointly made to both companies and the workmen worked where they were told. This line had its origins in the North Wales Narrow Gauge Railways, the line from Dinas (Caernarfon) to Rhyd Ddu built by C. E. Spooner in 1872 (virtually closed since 1916) and the Portmadoc Beddgelert & South Snowdon Railway promoted by the North Wales Power & Traction Co. as an electrically operated line, which had gone into receivership before any track had been laid. The Portmadoc, Beddgelert and Caernarvon Light Railway Committee was established in 1914 by several local authorities to acquire the powers of the NWNGR and the PB&SSR by purchasing them with a view to the completion and through operation of the railways for the public benefit. On the 18th October 1921 the Committee convened a meeting at which a spokesman said that although the war had delayed their attempts to complete the railway, it was fortunate that in the meantime the group that owned the NWNGR and the PB&SSR now owned a controlling interest in the Ffestiniog Railway. The owners with local authority support proposed quickly to complete the railway building work and asked that the combined railway undertaking be called the Welsh Highland Railway Company. It was pointed out that the Managing Director of the North Wales Power & Traction Co., Mr Henry Joseph Jack, was the Receiver of the NWNGR, a Director of the PB&SSR and the Chairman of the FR Co.. Mr Jack confirmed that the FR intended to enter into working arrangements with the two (WHR) companies and that unified administration and single control of rolling stock would bring in many economies. Everyone had great hopes for tourist traffic, which did not materialise; tourists were starting to prefer charabancs to trains. The WHR(LR) Co., on its formation in 1922, was thus a merger of the moribund NWNGR and the by then phantom PB&SSR. Nominally the NWNGR was bought for £40,000 and the PB&SSR was bought for £50,000, but these purchases were funded by the issue of shares in the new Company – no cash being involved. The WHR(LR) Co. reopened the northern NWNGR section and completed the unfinished line to Portmadoc in 1923. The cost of reconstruction and completion came to £84,775 and was met by a new debenture issue of which the principal holdings were £35,775 (42%) by the Ministry of Transport (sometimes described as a government grant) and a total of £29,000 (34%) by five local authorities (including £15,000 (18%) by the Caernarvonshire County Council). The remaining 24% of the debenture issue was subscribed privately. The revived enterprise was driven by the controlling interest of the North Wales Power and Traction Co., the principal shareholder of both the NWNGR and the PB&SSR and therefore of the WHR(LR) Co. In addition, the North Wales Power and Traction Co. was also the majority shareholder in the FR Co. and also in the Snowdon Mountain Tramway Co. The take-over of the FR Co. by the North Wales Power & Traction Co. in June 1921 with the forced retirement of all the existing directors, in favour of the entire board of the North Wales Narrow Gauge Railways Co., brought about the transfer of FR administration to Dolgarrog. However, the Dolgarrog Company was unable to provide the technical management that the combined railways needed. They established links with Colonel Holman Frederick Stephens, manager of several small independent railways, which had also managed to stay out of the groupings, and he accepted a part-time appointment as Engineer and Locomotive Superintendent. Further changes occurred at the end of 1924 when Jack resigned and Col. Stephens was appointed Chairman & Managing Director (whilst remaining as Engineer & Locomotive Superintendent). The administration and audit was transferred to Col. Stephens’ Headquarters at 23 Salford Terrace, Tonbridge in Kent from where he controlled the affairs of eight or nine other minor railways (three of which, all standard gauge, were Nationalised in 1948). Col. Stephens was seen as a practical man and an honest, fair and straightforward manager, but with too many diverse companies, such that his remote management always seemed like interference. Despite stringent economies, the WHR made a very small loss (a hundred pounds or so) in every year, and, was unable to pay the dividend on its Debentures. In consequence, in 1927, Stephens was appointed receiver for the WHR. Colonel Stephens died in 1931 and he was succeeded as Chairman & Managing Director of the FR by Evan R. Davies (Solicitor of Pwllheli and Buckingham Gate, London). At last the local director, protecting family investments, had made it to the Chair. C. Evan Davies became a director at that time. Now the local management had to deal with Buckingham Gate as well as Tonbridge (the audit function remained at Tonbridge until 1948) and they were tempted to play one off against the other. Evan R. Davies was not without ideas and worked hard in an attempt to pull the operation round but the railways were in a very decrepit state. The WHR(LR) Co. operated the line until June 1934 but the losses increased greatly. In that year, the FR Co. (to prevent the imminent closure and winding up) took a much-discussed 42-year lease (but it is noted that the WHR and the FR were effectively in common ownership and common management from 1922 onwards and the lease was an attempt to protect their WHR assets). Losses continued to rise and the WHR closed completely in May 1937. A High Court winding-up order was made in 1944, and by then most of the line had been lifted as requisitioned steel. The trackbed and other assets passed to the Liquidator, and, following his death to the Official Receiver. The company still technically exists, and, largely through the donation of shares, the FR Co. and its associates now control the entire issued capital and debentures of the WHR(LR) Co. of 1922. A letter in the FR archives, from Robert Evans (FR Manager) to J.A. Iggulden (the FR/WHR Auditor at Tonbridge) dated 12th November 1942 records his joy “that we are getting rid of the Welsh Highland Railway” and reporting outstanding financial matters relating thereto. The FR Co., still with Evan R. Davies as Chairman and Managing Director and Robert Evans as Manager continued in operation throughout the war, and Arthur Iggulden the Auditor (later a member of the Ffestiniog Railway Society) even managed to make the occasional visit from Tonbridge. An attempt to have the FR taken over by the government, as had happened in 1915, and as happened to the four main companies in 1939, failed. Passenger services ceased in September 1939, but slate and freight traffic continued through the war and trains ran just three days per week. Slate was of course the main traffic of the FR and of the WHR’s predecessors also, but the railways were general carriers and required by law to accept all traffic within its loading-gauge and capabilities. Coal was of course a very significant traffic from about 1865 onwards and, the FR, being narrow gauge, transhipment was necessary. Spooner laid out elaborate and efficient transhipment yards at Minffordd and, until the LNWR reached Blaenau Ffestiniog in 1881, large quantities of all types of materials were transhipped from the Cambrian Rlys at Minffordd and delivered to Tanygrisiau and Blaenau Ffestiniog. Following the completion of the LNWR line from Llandudno Junction to Blaenau Ffestiniog, most general freight went that way. But some freight remained. Deliveries of coal, agricultural supplies and animals were made to local farms and the villages of Llanfrothen and Maentwrog from Tanybwlch. Flour continued to be delivered from Portmadoc Flour Mill to the bakery adjoining Penrhyn FR station until the end of the war. An early and very specialised traffic was that of mining explosives carried to and from a secure brick-built magazine in Glanymor yard near the shore at Boston Lodge, and some distance from the nearest buildings. Special round-topped gunpowder vans were built for this traffic to and from the Ffestiniog quarries. One survives carrying the name ‘Curtis’s & Harvey’. The most unlikely freight was the regular transport pre-1915 of sea-water in a special wagon-mounted tank from Boston Lodge to Plas Tanybwlch for bathing purposes. One of the last regular weekly freight consignments was of ‘Fresh Sphagnum Moss’ from Tanybwlch (where it was cultivated by the Johnson family) to a hospital in Liverpool – this traffic continued throughout the war and until mid-1946. Mr and Mrs Robert Johnson are the tenants of the FR Co. at Coedybleiddiau Cottage where they have lived since 1951. The cottage, has a private railway platform, but no road access. The nearest road is over half a mile away by hillside footpath. The cottage was built about 1860 for the Superintendent of Line, Henry Hovenden. During the 1930’s it was rented out as a holiday cottage to several people including the composer, Sir Granville Bantock (father of Hamilton Bantock, the founder Chairman of the FRS Midland Group). Sir Granville was followed as tenant by John Philby, a leading British fascist and father of that notorious spy, Kim Philby. Bessie Jones of Tanybwlch always maintained that William Joyce (Lord Haw Haw) was a 1930’s guest of Philby. Shortly before the closure of the line, the body of Mr Evans, the tenant of Rhoslyn Cottage at Dduallt (also with no road access), was taken in the Ffestiniog Railway hearse to Blaenau Ffestiniog for his funeral in July 1946. The FR Co. has always taken this kind of social responsibility very seriously. The locomotive that hauled the hearse was No. 1 ‘Princess’, the first engine to run on the FR in 1863, and it was also the engine that hauled the very last slate train on 1st August 1946. The engine driver on the first of these occasions was Mr Tom Davies (his brother Evan may have driven on 1st August). Mrs Evans continued to live at Dduallt for about a year and had a wagonload of coal delivered by one of the quarry engines from Blaenau early in 1947. At that time there were other tenants of FR lineside houses and those at Moelwyn Tunnel Cottages (at one time five cottages with no road access – all now demolished) also received deliveries from Blaenau Ffestiniog by rail after the closure of the line. Tom Davies was born at No. 1 Boston Lodge Cottages and drove his first engine in 1922 but was made redundant in 1939 and worked at Cookes Explosives in Penrhyndeudraeth until 1944 when the railway asked for him back. When the railway closed in 1946, Tom returned to work at Cookes. He retired in 1966 and died in 1971. In its obituary the FR magazine wrote: “Tom Davies – The Festiniog Railway has lost a part of itself.” Tom loved the line and after its reopening took great joy in its success. He was a keen volunteer until his retirement and then a part-time employee. As a young fireman before the war, Tom Davies became a film star exchanging the token at Tanybwlch with Actress Louie Emery, dressed in Welsh Costume, as the Station mistress in the film ‘The Phantom Light’. Evan Davies, Tom’s brother, was also a longstanding FR employee and driver until closure in 1946. He retired to live in Barmouth but, following the re-opening, he regularly visited the line to give the railway the benefit of his knowledge and enthusiasm, often handling the double Fairlie with his brother Tom. Evan Davies died in 1963. The Ffestiniog Revival started in 1950 when Leonard Heath Humphrys visited Portmadoc and made contact with the FR Co. regarding the possibility of revival. The FR Co. held an EGM towards the end of 1950, which authorised application to the Ministry of Transport for an abandonment order. The Ministry of Transport advised the Company that they had no powers under Abandonment of Railways Act to issue an order (possibly because part of the railway, at Blaenau Ffestiniog, was still in use by slate trains). The railway had debts of £800 overdraft, £10,500 secured loan and further debts said to total £34,000. Only sale for scrap would enable debts to be paid off but as the Company had been advised that it neither had power to abandon its undertaking nor to sell it as scrap without passing on the debts to the purchaser nothing was happening. In retrospect, they would appear to have been very badly advised, fortunately. In April 1951, Portmadoc Urban District Council convened a meeting (attended by James Boyd, Leonard Heath Humphrys and four others) to establish the character and volume of local support, and suggesting progressive reopening from the Portmadoc end. The Portmadoc Committee was formed and held discussions with the Company in the summer of 1951. The Company brought its accounts up to date but refused to circularise shareholders, it also refused to consider a lease. Having placed advertisements in The Railway Gazette, The Engineer, and Engineering, and corresponded with many of the 48 people who expressed an interest, Heath Humphrys convened a meeting in Bristol on 8th September 1951, which was attended by Allan G.W. Garraway, Frederick Gilbert, Heath Humphrys, and eight others. Just one month later, a meeting was held at the Old Bull Inn, Barnet as a follow up to Bristol Meeting. A Legal Committee was formed with Frederick Gilbert, who was a North London Builder, engaging, initially at his own expense, his solicitor, Leslie Taylor Harris, to investigate the FR Co’s. Proprietorship. Soon after the Barnet meeting, Leonard Heath Humphrys (this young man was only 18 at the time) was called up for National Service. During the autumn of 1952, Frederick Gilbert and Leslie Taylor Harris had contacts with the FR Co. in order to identify ownership of shares and debentures. The holdings of FR Co. stock forming a controlling interest were Cynan Evan Davies (Ordinary and Preference Shares), The Aluminium Corporation Ltd (Ordinary Shares), and the National Provincial Bank (Debentures) and overdraft. Within the same period Tom King, a neighbour of Gilbert and a colleague of Les Smith, met Alan Pegler and told him of the position of the FR negotiations and of the need for money. Pegler, Smith and Trevor Bailey inspected the railway early in January 1953 and on 5th February 1953 Alan Pegler met the Committee. Many negotiations and transactions later, a new FR Company Board was sworn in on 24th June 1954 comprising Alan Pegler (Chairman) with Trevor Bailey, Bill Broadbent, John Routly and Leslie Smith (Directors) and Francis Wayne (Secretary). The Ffestiniog Railway Society (Limited by guarantee and registered on 24th December 1954) was formed to act as a supporting organisation for the organisation and motivation of the large body of volunteer support needed to restore the railway. The founding Directors were Leslie Taylor Harris (Chairman), Bill Broadbent, Allan Garraway, Frederick Gilbert, Len Heath Humphrys (Secretary), Tom King, W.K. Nelson and R.W. Winter. Leonard Heath Humphrys, Patron of the FR Co., convener of the Bristol meeting, and founding father of the Ffestiniog Railway Society died at Wrexham on 22nd December 2000 following a very short illness. Before anything could be done, protocol required that the Ministry of Transport be informed of the change of directorship and of the intention to re-open the railway to passenger traffic. By appointment, the Inspector of Railways, Colonel McMullen, met Alan Pegler, Trevor Bailey (employed by Ian Allen Ltd.), Bill Broadbent (a senior BR Locomotive Engineer), Len Heath Humphrys and Fred Gilbert at Blaenau Ffestiniog on 18th August 1954 for an inspection of the line. It was one of those very wet days when the rain never stopped. Phillip Vaughan Davies (a local enthusiast) and Jones Bach Y Cymro (the newspaper reporter from Dolgellau) were in attendance to provide local information. They were in fact the only ones present at that inspection who had seen the railway in operation. Also, Davies, a family friend of Will and Bessie Jones, had travelled many times. Only he knew that FR trains passed on the right – thus accounting for the unusual layout of the passing loops, which had surprised the Colonel. The inspection party managed to travel by trolley from Blaenau Ffestiniog to Whistling Curve (below Tanybwlch) where, owing to the number of trees growing between the tracks, the trolley had to be abandoned. This was about half way and they then walked the formation as far as Minffordd, below where, because of obstructions, they had to walk through adjoining fields to reach Boston Lodge. The Colonel reported his impressions over dinner that evening in the Oakeley Arms. He estimated that £40,000 would be needed to restore the railway and questioned whether the new owners appreciated just what they would have to do. Colonal McMullen was to become another valued friend. Ultimately the restoration was to cost well in access of £4,000,000. The railway reopened for passengers in stages from 23rd July 1955 on which date passengers were taken across the Cob to Boston Lodge and back. Trains ran to Minffordd in 1956, to Penrhyndeudraeth in 1957 and to Tanybwlch in 1958. After ten years consolidation and planning, passenger trains reached Dduallt in 1968. The passenger service was finally restored through to Blaenau Ffestiniog on 25th May 1982. The Revd J. Timothy Phillips, the son of a former FR Co. blacksmith, in his retirement, was a tenant at No 4 Boston Lodge from 1949 until his death in 1962. He was the self appointed voluntary caretaker of Boston Lodge Works. His efforts, in regularly securing the property (usually with hammer and nails), minimised loss through theft by souvenir hunters and others, which otherwise might have been serious. Morris Jones had been the foreman locomotive fitter at Boston Lodge, and when the railway closed he was in process of a major overhaul of ‘Prince’. He was about to fit a new boiler that had been delivered in 1945, and had continued to work on the engine for a further eight months as the FR Co. hoped to sell the engine (with its new boiler) to the GWR. When asked in 1954 to come back and finish the job he had started, he readily agreed and returned on Monday 20th September 1954, to start the long task of bringing this historic engine back to life. He remained on the payroll until after that job was finished in August 1955. Later he was to return often as a volunteer and advisor. Allan Garraway and Bill Harvey (both British Railways Locomotive Engineers) were the first volunteers and that same September day collected the key from Mr Evans and reported to Morris Jones at the start of the first working week at Boston Lodge Works and on the Ffestiniog Railway since March 1947. First, the Simplex petrol locomotive (built in 1917 for the British army in France) was revived and driven over the Cob to fill up with petrol at the garage in the High Street! (In those days there were lines though the streets). Clearence work during the winter of 1954/55 enabled a works train reach to reach Blaenau Ffestiniog GWR on 5th March 1955. Mr Robert Evans, manager for over 20 years, was presented with a mantle clock to mark his completion of 61 years continuous service with the FR Co. a few months before his retirement on 1st June 1955, when Allan G.W. Garraway, M.A., A.M.I.Loco.E. was appointed as his successor. Allan Garraway, the son of a distinguished railwayman, was a Cambridge graduate, who had served with the Royal Engineers in Germany where he was locomotive superintendent on the Detmold Military Railway. On his release, he trained for two-years at Doncaster and then, after a further two years spent at various locomotive depots, was appointed assistant to the Motive Power Superintendent, Eastern Region, BR. Volunteers were fundamental to restoring and re-opening the railway and in order to make best use of the volunteer labour force, local groups were established in major centres throughout Great Britain. Prominent in the early days were the London Area Group, the Midland Group, the Lancashire & Cheshire Group and the Hants and Sussex Group. Today there are 15 local groups as well as several specialist groups including the Heritage Group that undertakes specific preservation tasks as well as archival duties. The groups organise transport and often lodging for their members (the FR society has two palatial hostels) and on the railway do most of the track maintenance and tree lopping, plus repairs to walls fences and gates. In addition individual groups often take responsibility for undertaking specific works on the railway – e.g. London Area Group have for many years held the ‘contract’ for routine maintenance of trackside drainage. Safety is paramount and has always fully engaged the mind of the FR Management. All staff and volunteers are required to observe the rulebook, wear protective clothing, and register their presence on the railway and work under experienced supervisors. Operating staff and volunteers are required to attend training courses and undertake examinations. First-aid skills are also promoted. In June 1955, Will Jones was seconded to the FR by his employer, Merioneth County Council, for urgent permanent way work. This was a part-time arrangement, all that the railway could afford. In January 1956 Will became a full-time employee at a weekly wage of £7. At that time, the Manager, Allan Garraway, was paid £450 per year. Will Jones and his wife Bessie lived in the Tanybwlch station house to which Will had first moved in 1924, they married in 1929. He was there as platelayer and stationmaster and Bessie was a niece of near-by Creuau farm. Will was also required to take a turn as guard on the passenger trains. Will still found time to keep a smallholding and deliver coal from the Tanybwlch wharf to Rhyd and Llanfrothen. During the 1930’s Bessie was full time station mistress, appearing in summer in traditional Welsh costume. From the station house she sold teas to passengers and passers-by and continued to do this after the war, even though the railway was closed. Will became a roadman during the closed years. On his return, Will proved to be an invaluable and ever patient teacher of a succession of volunteer track gangs. During the lunch hour he was in his element as a storyteller and a few of his tales found their way into the magazine. One hilarious tale concerned the delivery of a pig in a livestock box (transferred from the GWR to the FR at Blaenau Ffestiniog) to farmer Parry at Dduallt sometime after 1923. Naturally the pig escaped, but the really interesting thing was that the farmer had sent his lad to meet the train with a horse-drawn sled, there being no roads at Dduallt. On another occasion Will said, in a most serious tone, “You people are a very bad influence on me (pause) “Last night I went home and spoke English to Bessie!” Bessie Jones continued her teas and her costumed appearances when the trains returned to Tanybwlch daily during the season for ten years until they both retired in 1968 to Will’s home village of Waunfawr. At his retirement, Will joined forces with Tom Davies of Bron Madoc to collaborate with the magazine editors in the production of three articles for the FR Magazine on the operation of gravity slate trains. These articles are of great value as few people (perhaps none) now remember the mechanics of this particular daily mode of operation. They were reprinted in booklet form in 1986. Till we ourselves will all be gone. Optically, both lines meet – at the very end. Drivers have always been scarce. In the early days the problem was acute. Tom Davies loved driving but needed his full time salary at ICI Explosives (as Cookes had become). The Manager loved driving but was needed to run the show. Bill Hoole was already famous in the railway world when he retired in 1959 from the Top Link at Kings Cross and exchanged the footplate of ‘Sir Nigel Gresley’ (London to Edinburgh 399 miles in 6¼ hours) for that of ‘Prince’ (Portmadoc to Tanybwlch 7½ miles in 40 minutes). Bill and his wife Dolly came to live at No. 1 Boston Lodge Cottages, and everyone rejoiced. Bill tried hard to persuade me to abandon the booking office for the footplate – but I have never felt comfortable in overalls! Bill died in 1979 after a very long illness. Michael was a founding volunteer and the guard of the first passenger train in 1955. He dearly wished to learn to drive but his eyesight, quite acceptable for his academic career, was not good enough for railway operating (neither was mine). From 1957 he was the Honorary Keeper of Archives and Relics to the FR Co. and devoted his life to sustaining the FR’s otherwise reluctant commitment to the establishment of proper museum facilities. He was a natural draughtsman, designer, artist and illustrator and used all these gifts generously in the service of the railway. The FR archives are extensive – the old company was a meticulous record keeper, and kept everything. Michael, with his assistant and successor, Adrian Grey, was instrumental in establishing an excellent relationship with the Gwynedd County Archives Service and many of the oldest FR documents are now safely housed at Caernarfon. Michael died after a long battle with cancer on 28th February 1999. The FR Co. hearse, attached to the 11:35 departure from Porthmadog on 16th October 1999 conveyed some of Michael Seymour’s ashes to their interment at Tanybwlch. Mrs. Charlotte Olive Edwards, Keeper, Quarry Lane (Lottie’s) Crossing, Minffordd. Acclaimed ‘One of the great personalities of the FR’. Lottie was an assistant guard during the war on the GWR between Pwllheli and Barmouth. She married David Edwards in 1945 and they moved to the long empty crossing keeper’s cottage in 1956, ready for the reopening of the line to Minffordd. Dai Edwards (Lottie’s husband and a member of the FR track gang) died in 1963 resulting from being tragically knocked down after alighting from a bus just a few yards from his home. When the FR magazine wrote about her in 1980, it apologised for the headline name ‘Lottie’. Had they used (as was their normal practice) her given name, readers would not have known whom they were talking about. The local newspaper in the early 1950’s had the same problem when it wrote an appreciation of her friendliness and helpfulness to passengers on the GWR during the war. It was in Barmouth that Lottie, as a child, learned the art of friendliness and hospitality, and it stood her in good stead. The local children (plus any visitors) were always welcome at the Crossing and became known as Lottie’s little helpers. Mrs. C. Edwards, c/o The Comptrolleuse, Railmen's Tea Centre. Mrs. C. Edwards, Curator and Chatelaine, Crossing House Corrective Centre. Sister Lottie, St. Edward's Foundation of Mercy and Succour. Loh Tee, Teahouse of the Wooden Spoon, Minffordd. Lottie retired in 1983, but continued to live in the crossing house until shortly before her death in 1992, the crossing having been automated in the most modern fashion. In 1987, a former old LAG, now a senior officer with BR, provided a birthday treat for Lottie: A steam hauled trip from Barmouth to Machynlleth in the former GWR Directors’ Saloon. In retirement, her many friends helped all they could and would have cheerfully modernised her house from top to bottom but Lottie refused entirely the upset of repairs or decorations. Following her death, this grade 2 house was thoroughly restored in her memory. Restoration work included the construction of a new route to avoid the Tanygrisiau Hydro Electric Power Station, and this involved the building – almost entirely by volunteer labour over a 14 year period – 2½ miles of totally new railway involving embankments, cuttings, long hillside rock shelves, bridges and culverts, and starting with of a massive spiral track formation (the only one of its kind ever built in the British Isles) and a major feature in the landscape. The route had been surveyed and laid out (1961-64) by a team of volunteers led by Gerald Fox who was at that time engaged in the construction of London’s Victoria Underground Line, later Fox went off to build modern tramways and rapid transit lines in the U.S.A. Digging started on 2nd January 1965. Lots were drawn and the winner was Dr. M.J.T. Lewis to whom fell the honour of turning the first sod. Volunteer teams led by Michael Schumann (currently a director of the FR Co.) and others built the spiral and its bridge to gain sufficient extra height to take the railway above the level of the reservoir that was now flooding the railway and the old Moelwyn tunnel. Bunny Lewis, as resident site foreman, was the solitary employee for most of the time. Once the deviationists had reached and excavated the approach cutting to the new tunnel, work continued on the other side. These volunteer navvies came in their hundreds, men and women from all walks of life, a good number from the City of London. This deviation was a major undertaking involving several hundred volunteer days work per month for over fourteen years from 1965 to 1978 and its story was fully told in Ffestiniog Adventure by Brian Hollingsworth . There was also the new tunnel, shorter but also, owing to modern regulations, significantly wider and higher than the one it replaced. This had to be blasted through hard, abrasive Syenite rock and after extensive planning, construction started in September 1975 and was carried out by three Cornish mining engineers, Robin Daniel, Bob Le Marchant and Pete Hughes, supported by generally less than 20 direct labour staff (12 engaged on a government subsidised employment scheme), plus volunteers, and with the aid of a substantial tourist board grant. The support work included the on-site crushing and grading of the excavated rock to make ballast in several sizes for use on the new railway. The new tunnel is 287 yards long and was opened on the 24th June 1977. The FR deviation was completed along the shore of Llyn Ystradau (Tanygrisiau Reservoir) and over the pipelines behind the power station to reach the outskirts of Tanygrisiau in 1979. Reinstating the original sensitive route through the backyards of Tanygrisiau and Glanypwll to a new joint station with British Rail near the site of the FR’s original Duffws station took a further 3 years. Mr Clough Williams-Ellis freely gave advice on landscaping matters. He had previously advised the old FR Co. in the 1930’s when he landscaped Dduallt station at their request. Col. A.H.K. Campbell came to live at Dduallt Manor in 1963. It was in a dilapidated/derelict state when the FR moved him in (this 15th century Manor House was without road access until about 1980) and restoration entailed the bringing in of very large quantities of building materials by rail from Tanybwlch. Oliver Cromwell is said to have stayed there. When in 1964, the FR Co. was looking for accommodation for volunteers working on the Deviation, the Col. agreed to rent a barn for conversion to a hostel. The Colonel bought two small diesel engines and wagons for use between his own siding and Tanybwlch where he rented a garage for his car. The Colonel’s railway activities were covered by a Running Powers Agreement with the FR Co. He had served from 1948 to 1960 in the Directorate of Army Legal Services, and became Assistant Solicitor to Merioneth County Council in 1967. Thus the first part of his journey to work was by train and the second by his own car – the reverse of normal commuting! Col. Campbell gave to the FR Co., from his own estate, the whole of the land occupied by the magnificent spiral track formation at Dduallt, including the hill in the centre. On account of his wartime exploits, Col. Campbell was a licensed shot-firer, thus the deviationists had their own resident volunteer rock-blaster always on site. The Colonel died in 1982 but trains still stop at Campbell’s Platform on request. He was a volunteer from Melksham in Wiltshire and made a deep impression. As soon as the budget allowed (about 1961) he was invited to work full-time for a pittance. Paul didn’t need asking twice. In the years from 1847 to 1851 the Works was considerably developed from its humble origins by the construction of ferrous and non-ferrous foundries, a pattern making shop, a blacksmiths shop, a carpenters shop, and an engine house in which a steam engine provided power for machinery in a sawmill, pattern shop and machine shops. In the 1870’s further construction provided a paint shop, joiners shop and erecting shop from which latter in 1879 and 1885 the Fairlie double engines ‘Merddin Emrys’ and ‘Livingston Thompson’ emerged as entirely own designed and own built machines. That the Works had the capability both in facilities and skill to produce such locomotives amply demonstrates the foresight and abilities of our predecessors. Since the mid 1950’s many of the original buildings have been extensively repaired and their usage altered. Machinery has been updated and modern materials and techniques have been introduced. Additional new buildings have been or are in course of construction and in July this year the cycle was again complete when from the new erecting shop emerged another own designed and own built Fairlie double engine ‘Earl of Merioneth’. We felt ourselves at last to be the equal of our predecessors of one hundred years ago! The principal function of the works has altered little during its history although the permanent staff workforce today (1979) is at thirty but approximately one third of that of pre 1914 days. Departments today having staff based at or working in the Works are the Mechanical, Locomotive Operations, Carriage and Wagon, Building, Signals and Telecommunications, and Electrical. This nucleus, of mainly highly skilled personnel, is supplemented by volunteers. A Works such as Boston Lodge, especially when geographically as remotely positioned and sustaining equipment of unusual type for which few proprietary spares are readily obtainable, has a need to be very self sufficient and in such we again emulate our predecessors. …. Whenever circumstances permitted, Boston Lodge inventiveness or pursuance of innovation has flourished and this trait is another which we trust …. you will note us to have emulated. Paul Dukes married a local girl, and his son has worked on the railway. Paul died young in 1992. It was recalled that he described himself as ‘A God-Fearing Man’. Fred Boughey, schoolteacher and carriage builder wrote: “I have personally lost a very well regarded ‘Old Mate’!” His father, George A. Dukes of Melksham, Wilts wrote to the magazine his thanks for his son’s fulfilling career and for his friends. Fred Boughey was a teacher in Birkenhead. When the railway needed additional coaches, Fred designed them, the way the best had always been, with a hard wood superstructure and a steel underframe. He persuaded Watsons, a local joinery firm in Birkenhead, to prefabricate the woodwork. With staff and volunteers, Fred built six ‘Centenary Stock’ coaches in the holidays and at weekends at the rate of one each year. The first two, a great advance on the previous best, were in service for the passenger centenary in 1965. In 1975 Fred retired early and came, with his family, to live at Boston Lodge and work full time for the “Fewtincog” as he often calls his favourite railway. Mrs Alice Boughey died in 1995. There are usually about 40 boys in the party, with four male staff and Mrs. Catchpole (SRN) as matron. A typical daily roster is: two boys at Portmadoc car park, two at Tan-y-Bwlch car park; one each in the shops at Porthmadog and Dduallt; ten concreting (or similar building work) in Boston Lodge; three on buffet duties and one in the Tanybwlch cafe; ten tree lopping for PW department and twelve, each day, on a visit to any one or two of seventeen places visited annually. They now have enough tools to equip the whole party and, as a base, have done up some very small, formerly derelict, quarrymen’s cottages in Portmadoc, of which the principal one is called Plâs Penbwll, i.e., Tadpole Hall. The boys stay in various houses in Portmadoc. Keith became involved with the FR after reading about the possibility of restoring it in the Peterborough column of the Daily Telegraph in 1954. Mrs. Edith Catchpole died in AD 2000. The two elderly ladies who have for a long time owned Plâs Penbwll have recently given the property to the FR Trust. At least one other school party came regularly. ‘The Brambles’ were from a school called Brambleton. Children still come to work on the railway, often with their parents, and also every year there is a well organised ‘kids week’ that usually attracts over 50 children (13+) and over 20 experienced supervisors. Evan M. Davies joined the staff at Boston Lodge Works as an apprentice at the age of 15 in 1959. At that time Evan’s mother, Janet, was the crossing keeper at Penybwlch, Penrhyndeudraeth assisted during the holidays by daughter Avril. On hot summer days they were rewarded with ice creams thrown from the buffet car door as the train sped through the crossing at 10 mph (of this I can vouch). Mr Ednyfed Davies (father of Evan and Avril) died in August 1968. He had often assisted his wife Janet in handling the gates. Janet gave up the crossing in 1975 when Avril took over until her mother’s death. By 1964, Evan was driving regularly and soon developed the ability to coax maximum power out of the Fairlie double-engines. On the 26th August 1967, Earl of Merioneth with Evan driving took twelve bogie-coaches and over 400 passengers from Portmadoc to Tanybwlch in 40 minutes including three lengthy stops en route to board more passengers. Expertise like that earned Evan popular recognition as ‘the double-engine driver’. Tall and always smartly turned out, Evan appeared on TV in 1975 when the BBC ‘Nationwide’ programme featured Porthmadog Harbour station with Valerie Singleton interviewing the celebrated double-engine driver. In 1987, Evan had a ‘bit of an accident’ in gale force winds. Having shut the door of the long locomotive shed, the wind blew it back at him and off its hinges. Two days later Evan discovered that the pain in his leg was indeed a fracture. The shed was boarded up pending a Board decision. Nature was unwilling to wait for a Board decision, and blew the roof off – end of the long shed. In 1996, The FR Co. sent Evan to South Africa to learn how to drive the two Beyer Garratt locomotives that they had bought for service on the Welsh Highland Railway and on which line he was preparing to become the driving instructor. He already knew the South African staff, Phil Girdlestone (long time FR supporter and Boston Lodge employee until November 1985, and now with the Alfred County Railway in Natal, South Africa) and Shaun Mc Mahon (a former FR fitter). While there, Evan sustained a heavy fall, which appears to have triggered the illness that led to his death at the age of 51. Elizabeth Avril Hartfield (née Davies) MBE (sister of Evan) died in a London hospice in 1998 aged 49. Avril will always be remembered as the friendly crossing keeper at Penrhyn until she moved away following her mother’s death. She married had two children and made her mark as a school-crossing keeper for which she was awarded the MBE. Leslie John Walshaw Smith received the MBE in 1993 and died in 1997. Les was the FR Co. Director famous for winning (with John Routly) the long compensation battle with the Central Electricity Generating Board and for the sensitive and detailed negotiations with farmers, landowners and local authorities during the long process of Deviation and Restoration of FR Services to Blaenau Ffestiniog. The decision of the Lands Tribunal was given in 1971, thirteen years after occupation, and after ten years of legal battles. The eventual compensation was under £100,000 including interest, but it helped pay for the tunnel. As a direct result of the FR v CEGB case, Parliament passed the Land Compensation Act of 1973, which stipulated that acquiring authorities must pay 90% of their estimate of compensation within 6 months of entry. Much earlier, on his retirement in 1979, Allan Garraway, FR General Manager 1955-1979, had been awarded the MBE in the Queens Birthday Honours. He was the first volunteer and the first General Manager under the new dispensation. Allan is still a regular visitor. Mr Alan Pegler, who, with generous enthusiasm, purchased the controlling interest in the FR Co. in 1954 and subsequently put his entire holdings into a charitable trust ‘The Festiniog Railway Trust’, is Honorary President of the FR Co. and the FR Society. Alan now suffers from Parkinson’s disease but still visits the line regularly with the aid of friends and relations. Patrons currently include Sir William McAlpine Bt. and Sir Peter Parker (former Chairman, BR) together with M. Jean Arrivetz (the leading French narrow gauge restorer and preserver), Robert C. Black III (leading U.S.A. preservationist) and Dr R. Nicholls of Canada. Sir Osmond Williams Bt. was a trustee until he retired in 1995. One of the founding directors, John Routly, High Sheriff of Buckinghamshire (1972-73), was Chairman from 1972 to 1993. His was the FR’s guiding legal mind for 40 years. John took great satisfaction in the successful conclusion of the second longest law case in legal history. The folk mentioned are just a few of the hundreds of people who were active in Ffestiniog organisations during the first 25 years of the revival. Hundreds more have come along since that time. Some have been paid for their full time labours; others have given freely of their time and energies. Those who accept office, as directors or trustees, receive no remuneration and are expected to work hard for the Company. There have been just a very few distinguished visitors in the last 50 years. The visit of Dr Hastings Banda accompanied by Lord Snowdon in 1968 was followed in 1975 by that of HRH The Princess Margaret with Viscount Lindley (who rode on the footplate – the Ministry of Transport were not amused) and Lady Sarah Armstrong-Jones. The special train ran from Minffordd to Dduallt and round the spiral to see the Deviation and a passenger platform was built for the occasion near the head of steel. A much earlier Royal Visit occurred in 1889 when Queen Victoria accompanied by Prince and Princess Henry of Battenberg visited Palé Hall. On the day of the planned visit to Barmouth (to lay the foundation stone of St. John’s Church) and afterwards to Tanybwlch, her Majesty chose to remain at Palé and it was left to the Prince and Princess to ride the Great Western, Cambrian and Ffestiniog Railways. The Prince and Princess were received at Minffordd Junction by Mr & Mrs Williams of Castell Deudraeth. A Guard of Honour was mounted by the 2nd Volunteer Battalion Royal Welsh Fusiliers, commanded by Captain Casson, and the Princess was presented with a bouquet by Miss Olwyn Williams. The Royal Party were conducted by Mr Williams to the Ffestiniog Railway Station where they were met by Mr & Mrs Oakeley and Miss Oakeley. They then travelled by special train to Tanybwlch where they took tea with Mr & Mrs Oakeley while the Oakeley Silver Band played on the terrace. Mr Spooner presented an album of photographs of local scenery to the Princess. Mr Oakeley afterwards drove the Prince and Princess to Maentwrog Road, for their return by The Great Western Railway Royal Train to Llandderfel. The restoration of the line was marked by the official opening of the new Blaenau Ffestiniog Station in 1983 by the Right Hon. George Thomas, Speaker of the House of Commons. The Speaker travelled from Porthmadog to Blaenau Ffestiniog by special train. The engine’s headboard carried his coat of arms and stated ‘Trefn! Trefn! Order! Order!’ which amused him greatly and which he later autographed. The Royal Oakeley Silver Band and the Brythoniaid Male Voice Choir provided music. There is, of course, that other narrow gauge railway at Porthmadog, the Welsh Highland Railway. Following several public enquiries, light railway orders and planning applications, the rebuilding and operation of that line from Caernarfon via Dinas, Waunfawr, Rhyd Ddu, Beddgelert and the Aberglaslyn Pass to Porthmadog is once again entrusted to the Ffestiniog Railway. The civil engineering work has been mostly sub-contracted to North Wales firms like Mulcair of Caernarfon, Jones Brothers of Ruthin, and Colin Jones (Rock Engineering) Ltd of Porthmadog, with the tracklaying undertaken by local staff and volunteers. This is a major story in the making. The gradients on this line are about 1 in 40 and this is about twice as steep as the Ffestiniog line. To operate the WHR, the FR has imported two massive Beyer Garratt locomotives from South Africa. One of these was the last articulated steam engine built in Britain, in 1958 – last that is until the Ffestiniog Railway itself built three more articulated locomotives at Boston Lodge (to Robert Fairlie’s designs) in 1973, 1992 and 1999. These powerful engines, are larger and heavier than many BR branch line locomotives were. They were built by Beyer Peacock in Manchester to the world famous designs of Mr. H.W. Garratt, who adopted similar articulation principles to those of Robert Fairlie. The railway is now fully operational from Caernarfon to Waunfawr and work towards Rhyd Ddu is progressing well. The very first Garratt articulated locomotive was built in 1909 for the North-East Dundas Tramway in Tasmania where it carried the number K1 and worked until the line closed in 1929. K1 rusted quietly in Tasmania until 1947 when it was re-purchased by the makers and returned to Gorton, Manchester as a museum exhibit. On the closure of Gorton Works in 1966, it was sold to the Ffestiniog Railway. When fully restored later this year, this famous engine will also run on the Welsh Highland Line. K1 – The world’s first Beyer Garratt locomotive in service on the Welsh Highland Railway. In 2003, HRH Prince Charles The Prince of Wales re-opened the latest section of the WHR from Waunfawr to Rhyd Ddu and drove the train between Snowdon Ranger and Rhyd Ddu – see link, which has further links to other sites with full details of the Ffestiniog and Welsh Highland Railways. Thomas Firbank, I Bought a Mountain (London, George Harrop & Co, 1940) Chapter 19. Wales (Newton Abbot, David & Charles, 1980) Chapter VII page 110. Phillip Vaughan Davies, Memories of the Narrow Gauge, Heritage Group Album (FR Society), 1994. Wales (Newton Abbot, David & Charles, 1980) Chapter VII page 100. Carrington & Rushworth, Slates to Velinheli (Maid Marian Locomotive Fund, c1971) page 40. Carrington & Rushworth, Slates to Velinheli (Maid Marian Locomotive Fund, c1971) page 41. Appendix II – Llanberis (Southwest) District Industrial Tramways. J.I.C. Boyd, Narrow Gauge Rails in North Caernarvonshire, Vol 1 – West (Oakwood Press, 1980) pt 1. J.I.C. Boyd, Narrow Gauge Rails in South Caernarvonshire, Vol 1 (The Oakwood Press, 2000) part 6. Chronology (Ffestiniog Railway Heritage Group, 2000). Study Centre, 1987) pages 6-9. Study Centre, 1987) page 15. M.J.T. Lewis, How Ffestiniog Got its Railway, (Railway & Canal Historical Society, 1965) page 9. M.J.T. Lewis, How Ffestiniog Got its Railway, (Railway & Canal Historical Society, 1965) page 12. J.I.C. Boyd, The Festiniog Railway, Vol 1 1800-1889 & Vol 2 1890-1959 (The Oakwood Press, 1959). 2º Gulielmi IV.Regis. Cap.xlviii. – It is to protect its unique historic status that the company has been reluctant to vary the spelling of its name especially in formal documents, but normally in day to day usage it now adopts the current conventional bilingual ‘Rheilffordd Ffestiniog Railway’. J.I.C. Boyd, Narrow Gauge Rails in South Caernarvonshire, Vol 1 (The Oakwood Press, 2000) part 4. National Park Authority, Royal Commission etc, 1996) page 48. Granite Co. Ltd., undated booklet c1950-60) . quoting Oswestry Advertiser – in the Heritage Group Journal (FR Society) No. 63. Autumn 2000. Post card reproduced, Ffestiniog Railway Magazine (FR Society), No.170, Autumn 2000, (page 71). Ffestiniog Railway Magazine (FR Society), No.136, Spring 1992, (page 157). M.J.T. Lewis, How Ffestiniog Got its Railway, (Railway & Canal Historical Society, 1965) page 24. (FR Society) No. 50. Summer 1997 (pages 16-22) & No. 51. Autumn 1997 (pages 7-15). (FR Society) No. 68. Winter, 2001/02 (page 7). (FR Society) No. 57. Spring 1999 (pages 21-27). Ffestiniog Railway Magazine (FR Society), No.30, Autumn 1965, (page 18). J.I.C. Boyd, The Festiniog Railway, Vol 2 1890-1959 (The Oakwood Press, 1959) page 258. (FR Society), No.172, Spring 2001, (page 148). Ffestiniog Railway Magazine (FR Society), No.45, Summer 1959, (page 24). by Will Jones, Tom Davies and others in FR Magazines Nos. 44, 45 & 46. Will Jones, obit, Ffestiniog Railway Magazine (FR Society), No.95, Winter 1981-2, (page 2). Ffestiniog Railway Magazine (FR Society), No.69, Summer 1975, (page 21). John Harrison, Ffestiniog Railway Magazine (FR Society), No.126, Autumn 1989, (page 252).